In legends and myths from cultures around the world, the trickster is always the most interesting character. And they are often a fox, as in the book, The Tale of Tricky Fox, which features an addictive little sing-song and dance by the fellow. So having a fox around to make trouble is useful. 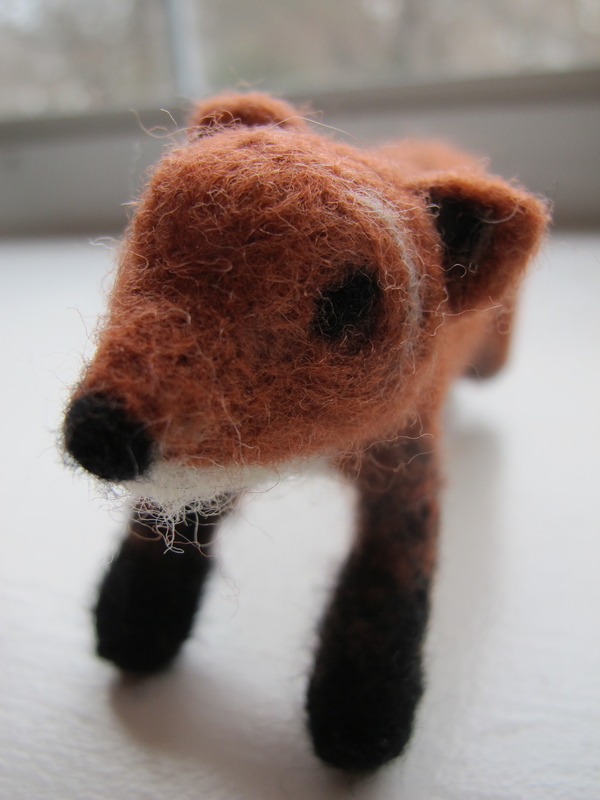 For one, if someone happens to do something naughty, both parent and child can blame it on that wily vulpine visitor. 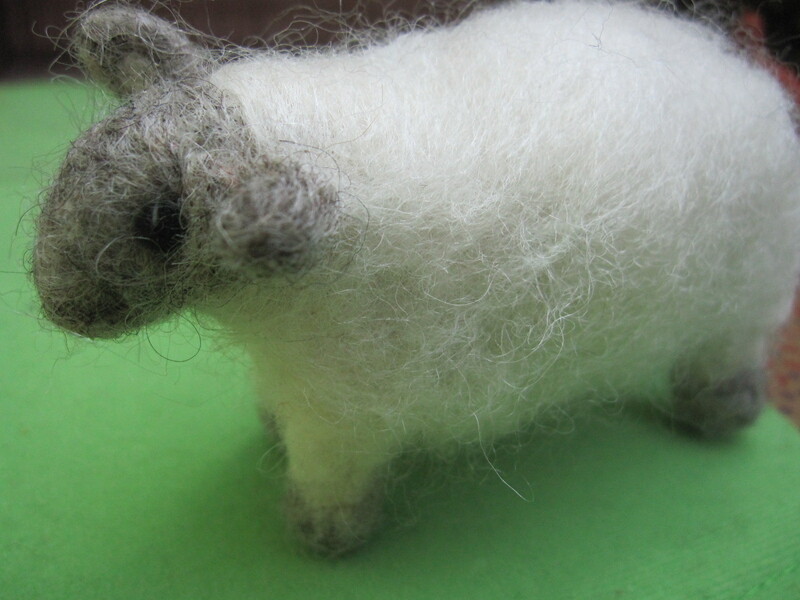 As I’ve mentioned, I find needle felting a rewarding craft in which it’s shockingly easy to make something adorable, like this sheep or other animals. Once you’ve tackled the fundamentals a few times, you can make almost anything. It’s also very forgiving: you can easily change your mind about an addition or reshape the object as you go. 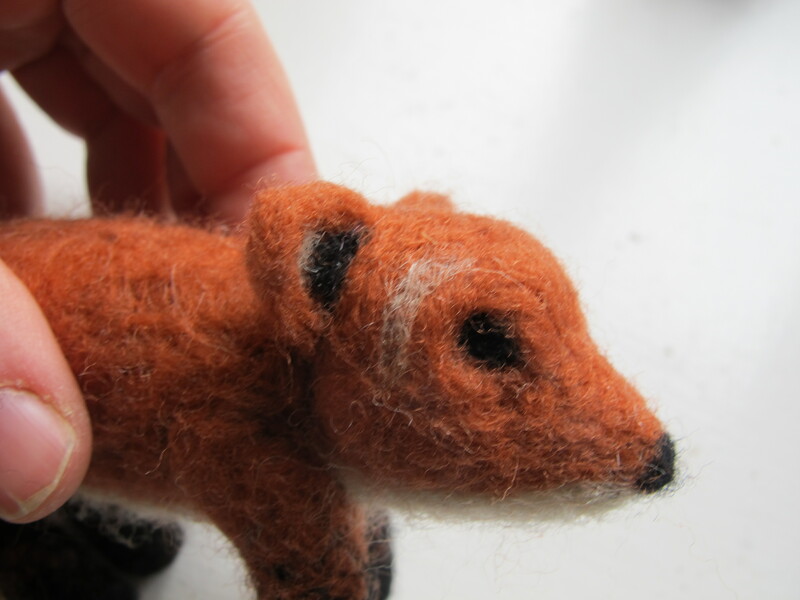 The popularity of the sheep tutorial is what inspired me to offer up another one for this fox, but the principles are similar for both furry creatures. Children — those over around 5 or 6 years old, depending on their level of patience and coordination — would also be able to make something this way, though you should probably start them on small cookie cutters and flat shapes first. 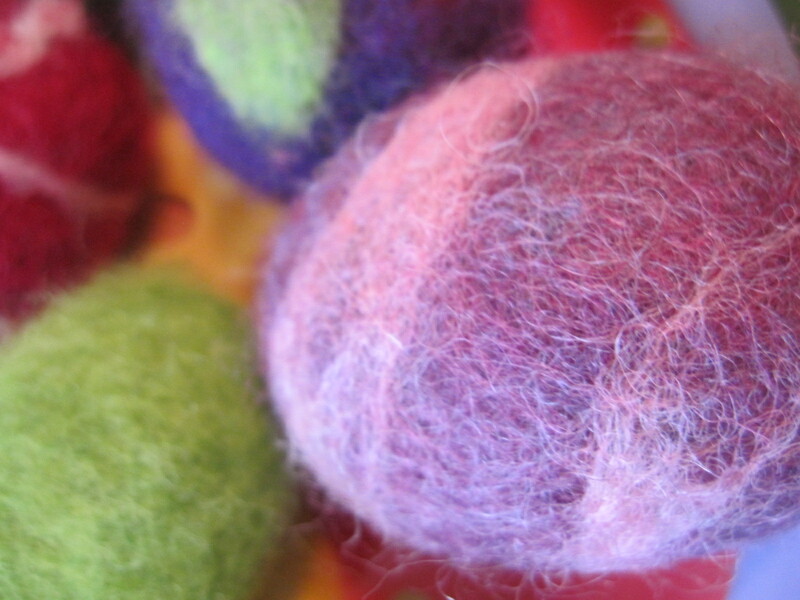 Wet felting — like these Easter eggs — is great for that age and for younger crafters. 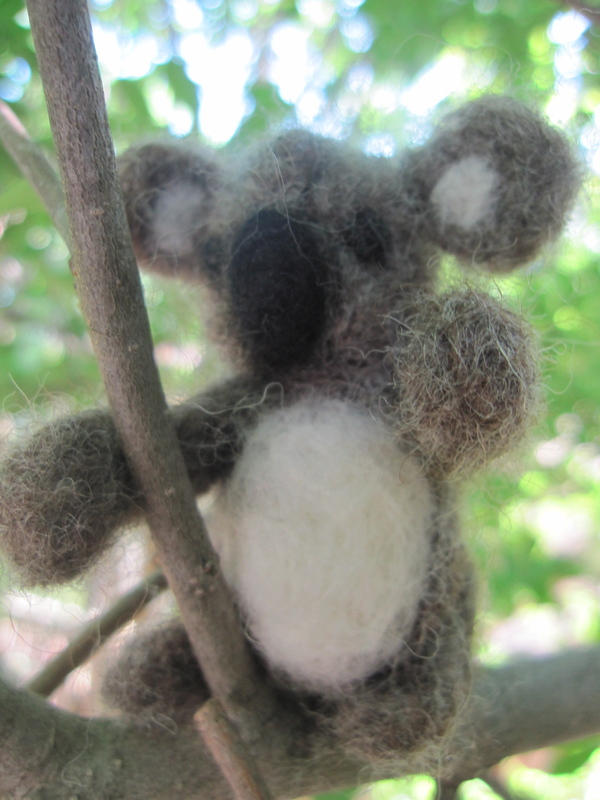 The needles are available in several sizes or “gauges.” Most dry felting work, done with medium grade wool, uses 36 or 38 gauge. For finer surface work, or finer fibers, move up to 38 star or 40 gauge. For coarser fibers, move down to 32 gauge. 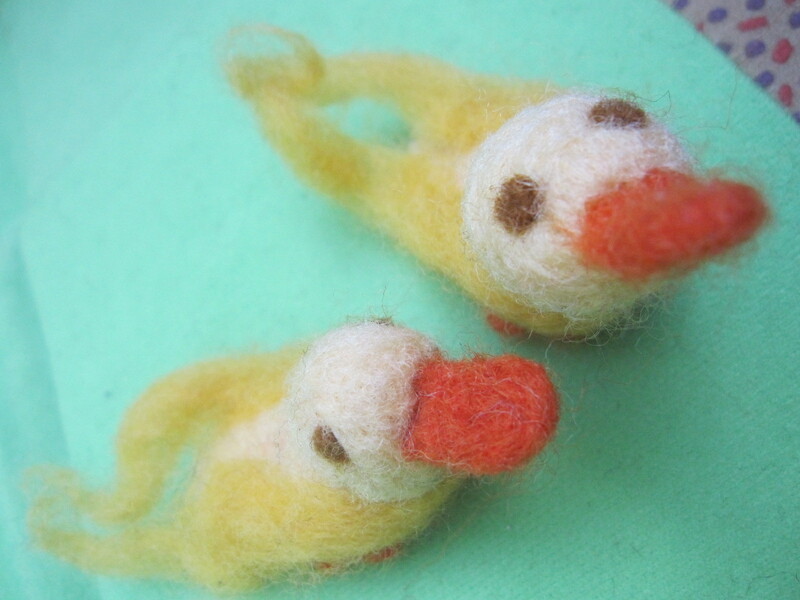 Two pipecleaners. Any color will work for this project. The concept is straightforward: the needles are barbed, and each poke knits the roving together, eventually becoming more solid. The only rule is to keep the needle moving straight up and down, as the tip breaks easily. 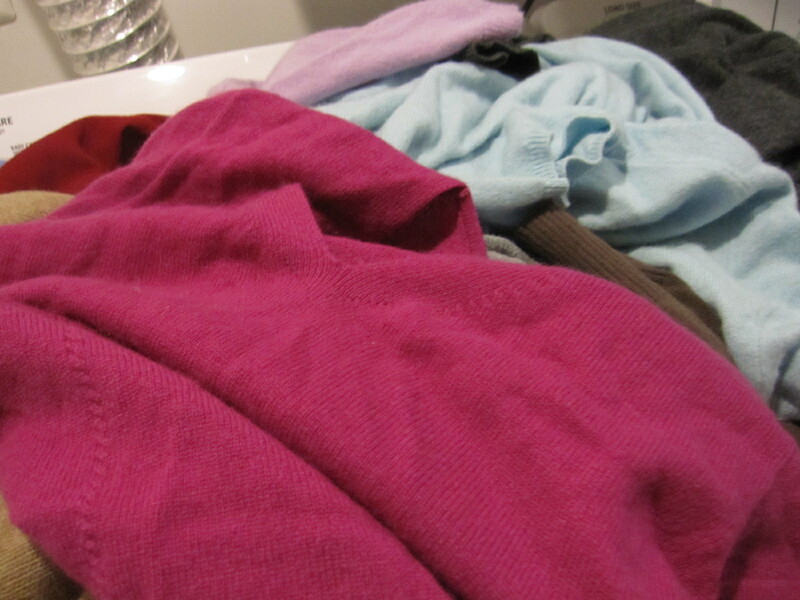 The other precaution is to try to keep from poking your fingers, as the needles are super-sharp. This does not keep me from doing it in front of the television, though, so some injury is likely inevitable. Tant pis. 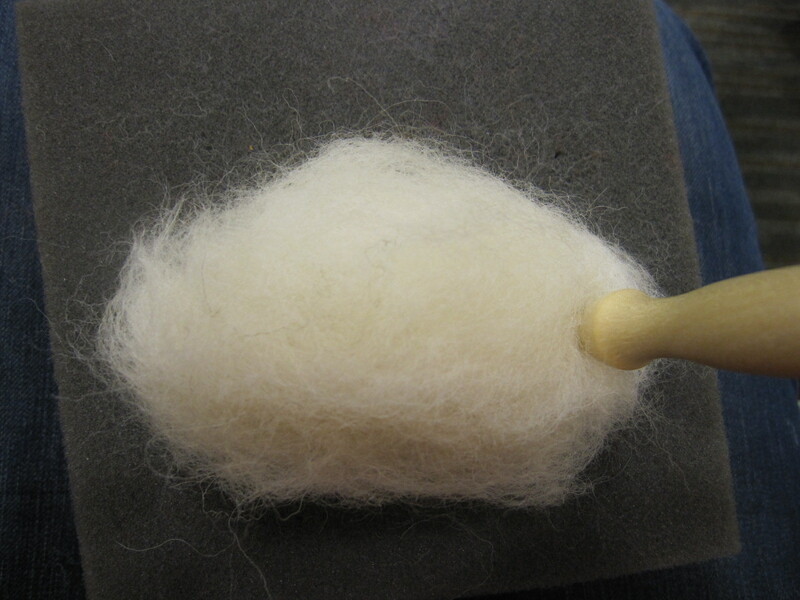 Start by forming an oblong ball in off-white roving and using the larger gauge needle to poke it into shape for the body. 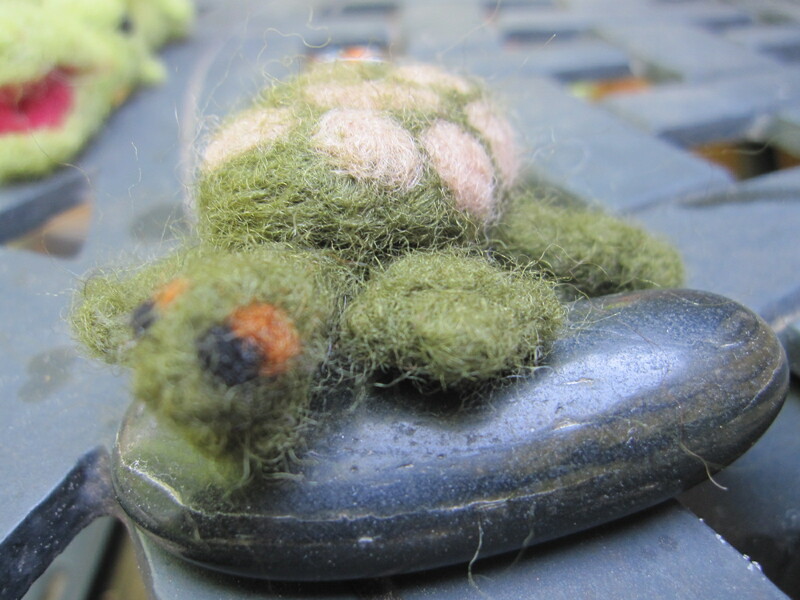 Continue turning the oblong over as you felt the roving, keeping the level of felting roughly uniform on all sides and front and back ends. 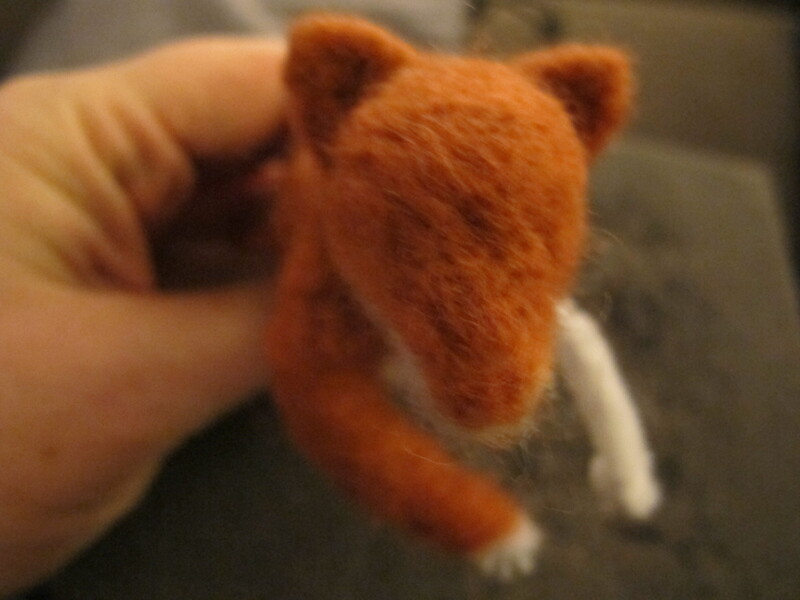 Our fox was about four inches long and two inches high on the sides of the body. 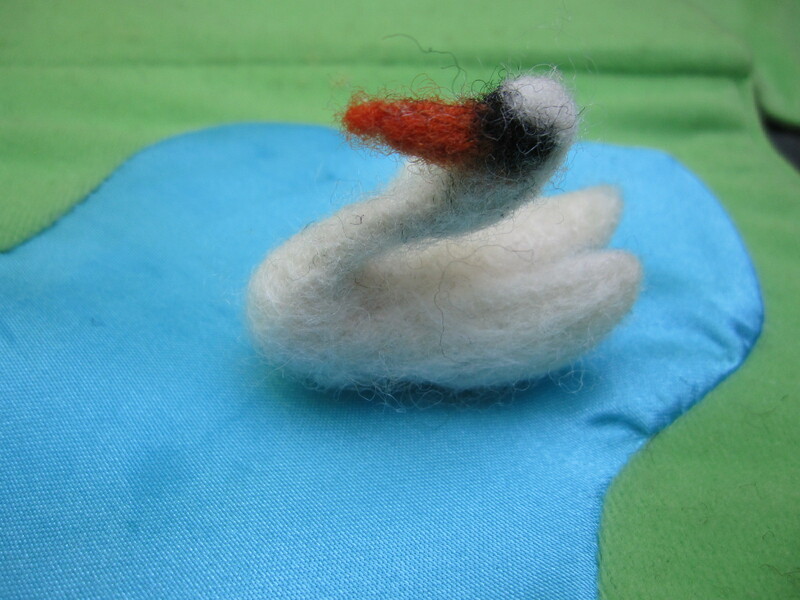 As it shrinks from being poked, lay more flat strands of felt around it to maintain the same approximate size. Leave the neck area a little less worked than the other portions of the body. 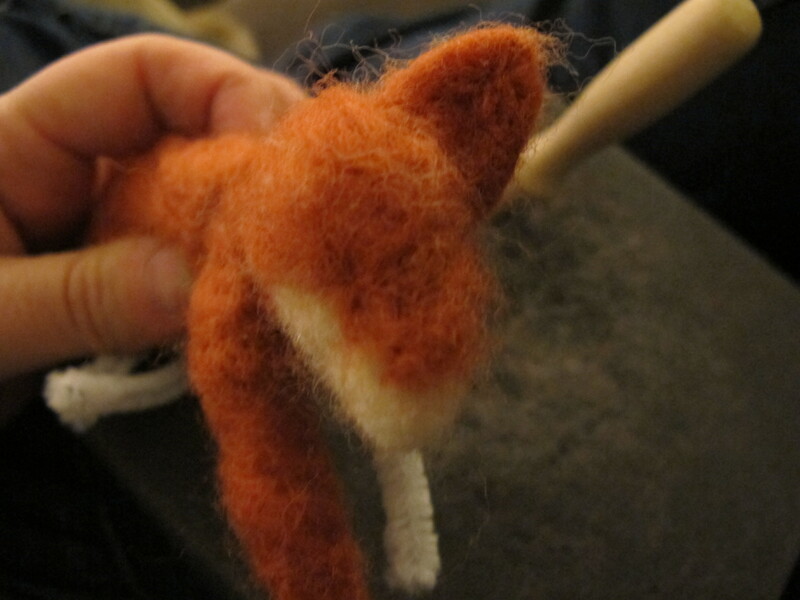 When you have a shape with the basic dimensions you’d like, but before it gets too tight and packed in, thread two pipecleaners through the approximate front and hind quarters of the fox-to-be, cut them at the appropriate leg length plus a smidge to allow for bending the tips in, and fold the wire tips over to make feet. Stand it up a few times to make sure you’ve gotten the lengths right, and adjust as needed. 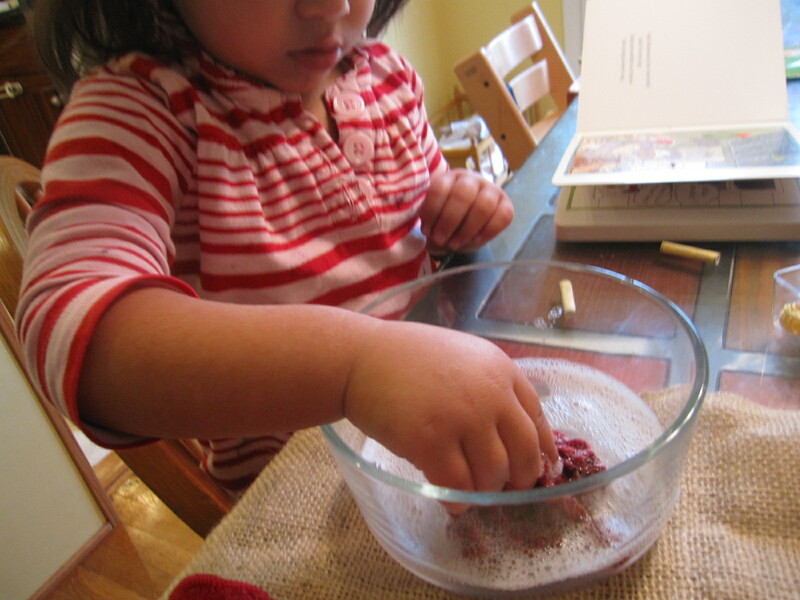 Then make the head by forming and poking a ball separate from the body. Start with a oval, and as you work with it and it starts to respond better to the needle, angle the front and sides to create an elongated triangle. Foxes are all angles and snout in the front. Keeping a ridge where the eyes and ears will go is important as well, as above. Again, leave the neck less worked so as to allow for it to be easily attached to the body. 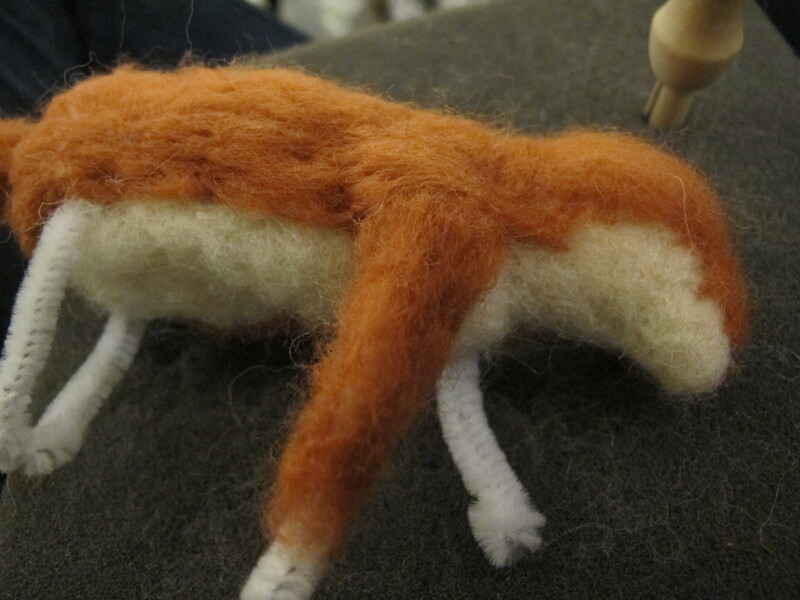 Add the formed head to the body, layering strips of additional wool around the ridge on the top of the head and the neck as needed. 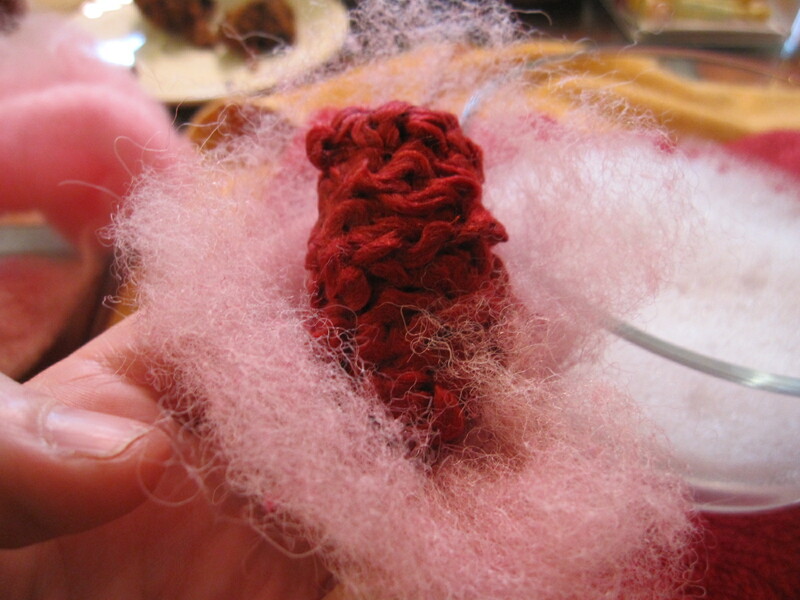 Layer on the red by pulling to extract flattened pieces of roving, laying them onto the body and poking into place where you want it. Where you put your needle is where the wool will go. Look at images of foxes on-line as you may need: foxes have white underbellies, and red coats on top, with red markings on the top of their heads and white jaws below their noses. 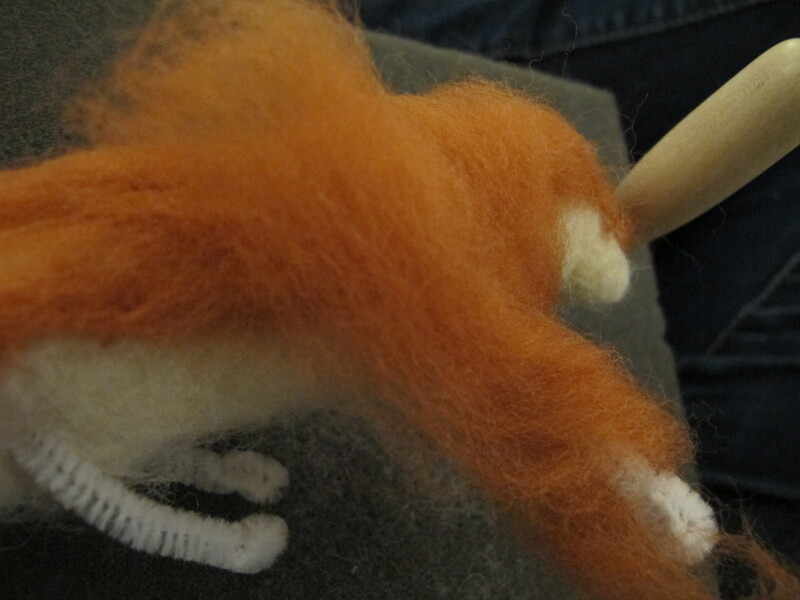 After you get the wool tacked onto the body as you need, add a layer of red wool to the legs as well, taking care not to break your needle on the wire inside the pipecleaner. Poke to the side of the wire, and around. 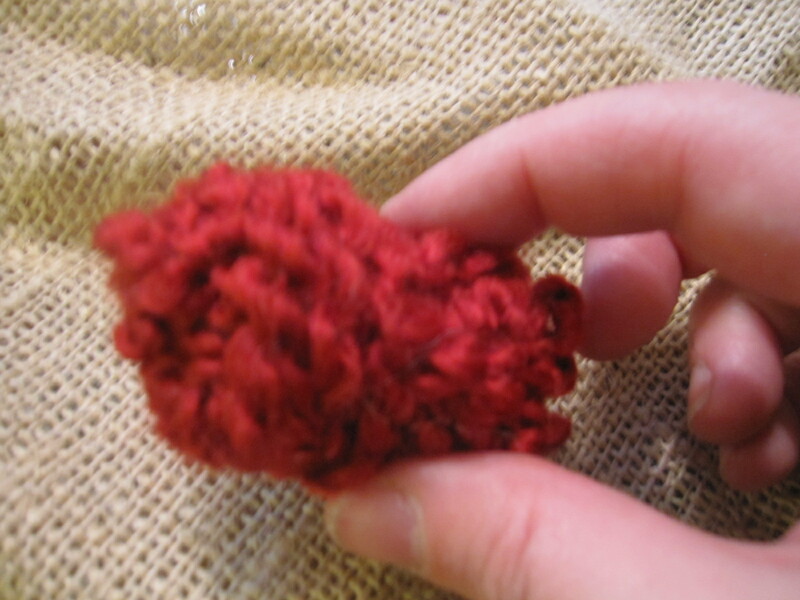 Next make the ears by poking a small amount of red roving into a pointy triangle and leaving the bottom less worked. Attach to each side of the head at an angle. 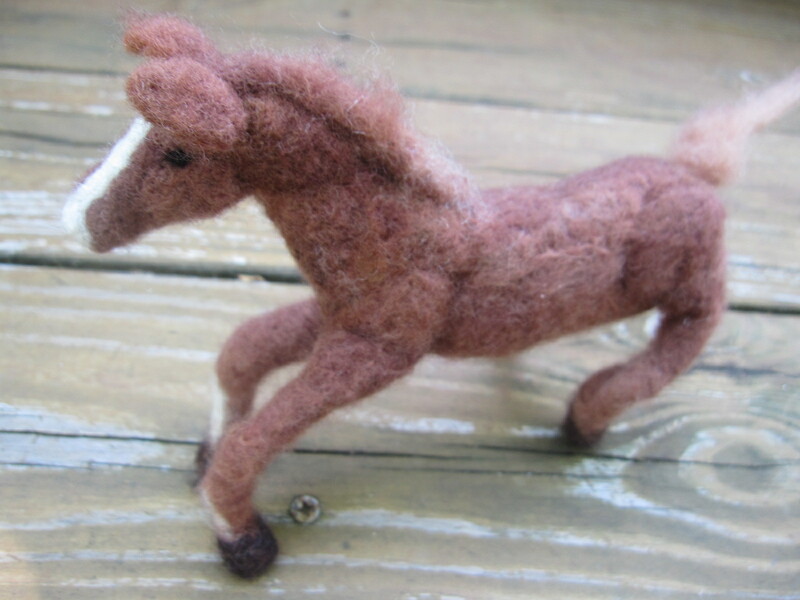 Finish all four legs and both ears. 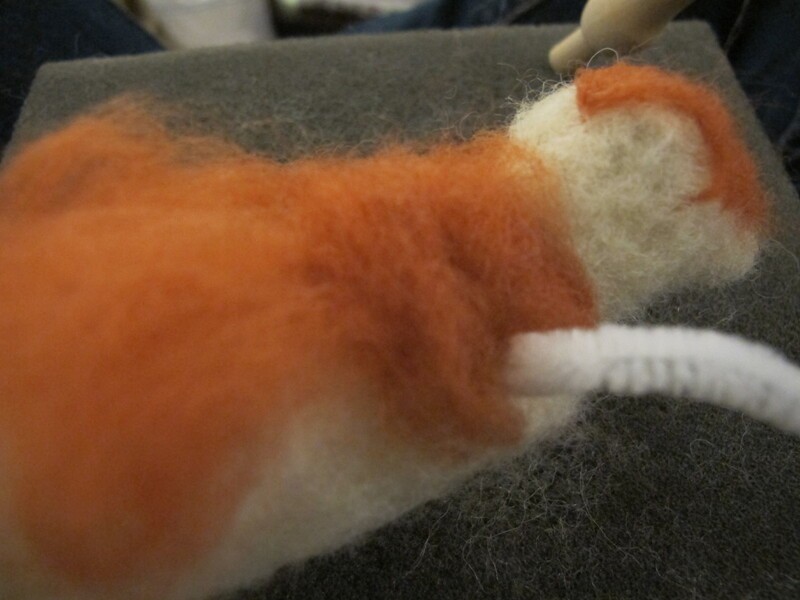 Next, add a less-worked long clump of roving for the basic part of the tail. Work the attached part well into the body. 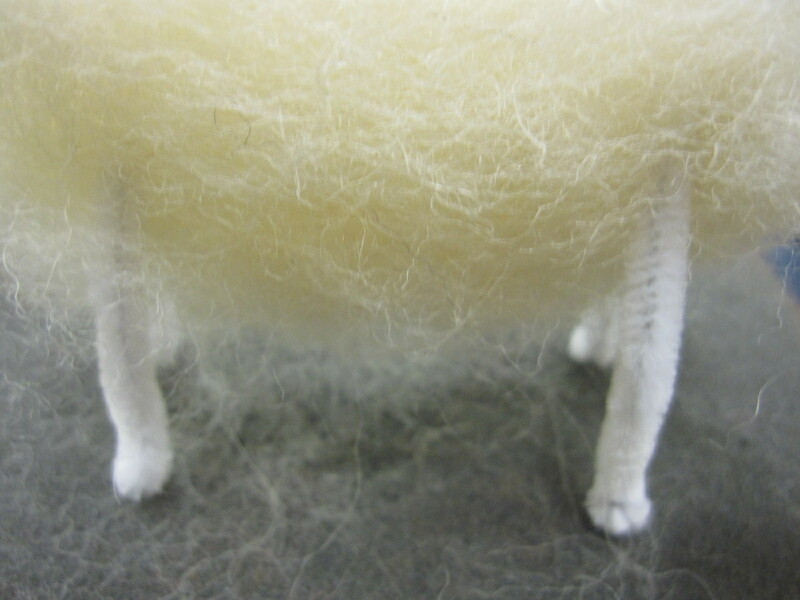 Add a layer of black roving to the feet, with less density as it goes up the leg. 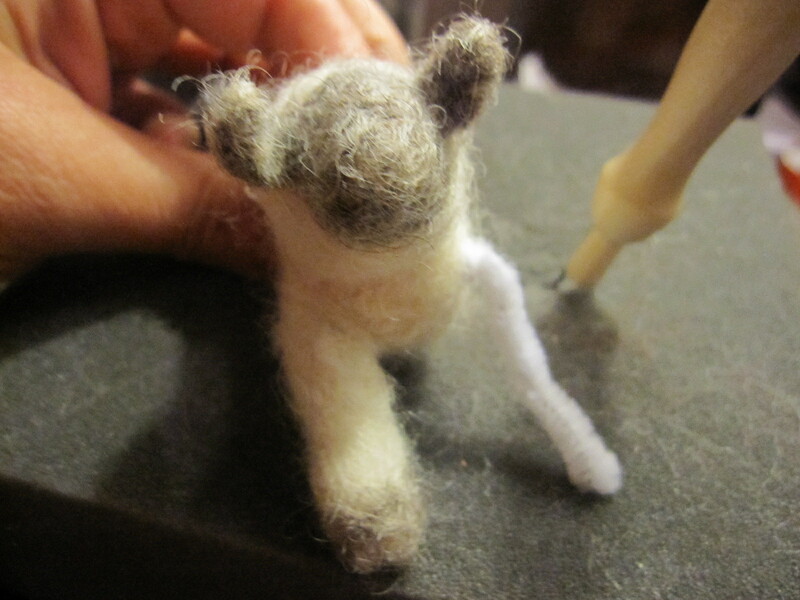 In the uppermost picture, the left leg shows the worked roving and the right leg shows the work-in-progress. Add black to the tail, and then a white tip. 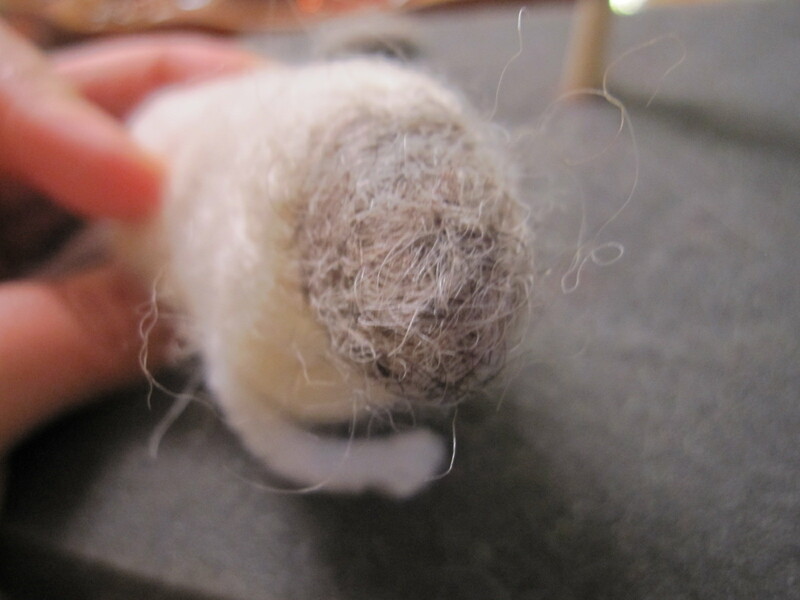 Needle features from very small amounts of roving into the face, including black and white touches in the ears and above the eyes. 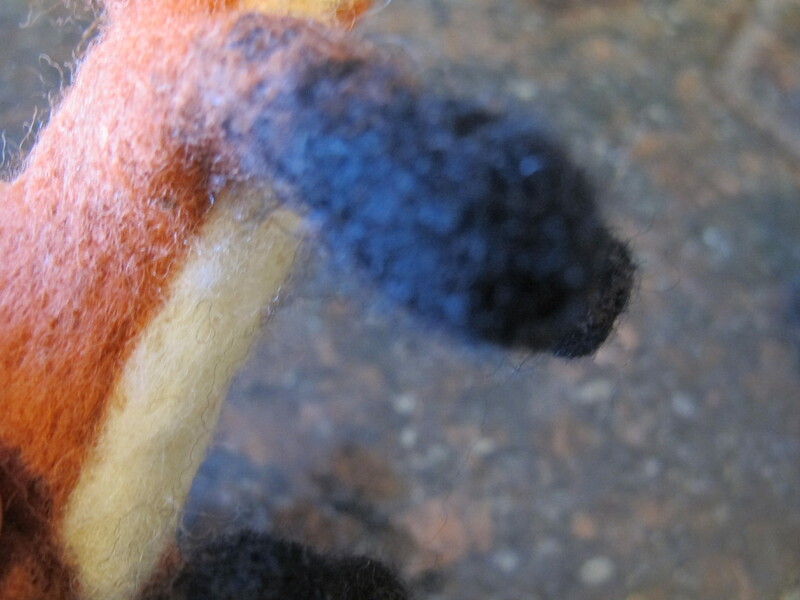 Add a little more red to the back of the ears if necessary to keep the black from showing through. 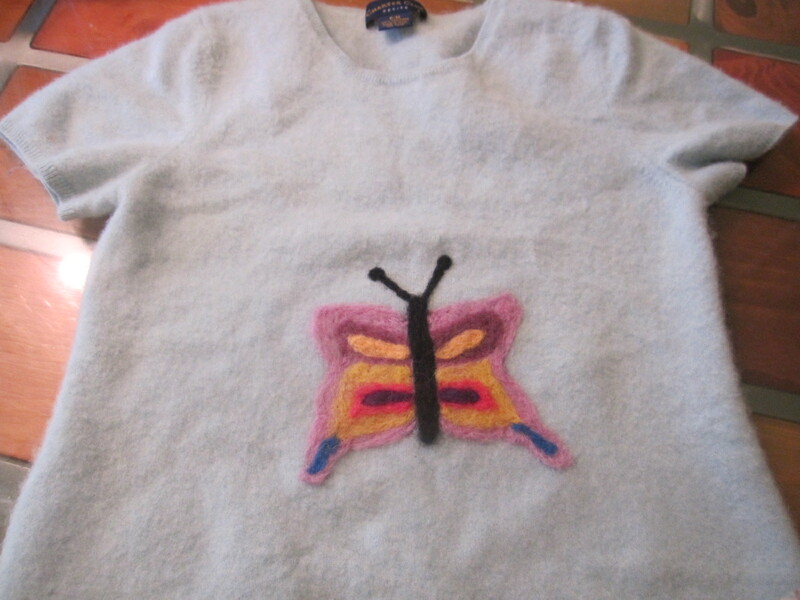 Add white to fill out the belly and create a nice line. Adjust the head shape as you like, checking it against pictures. 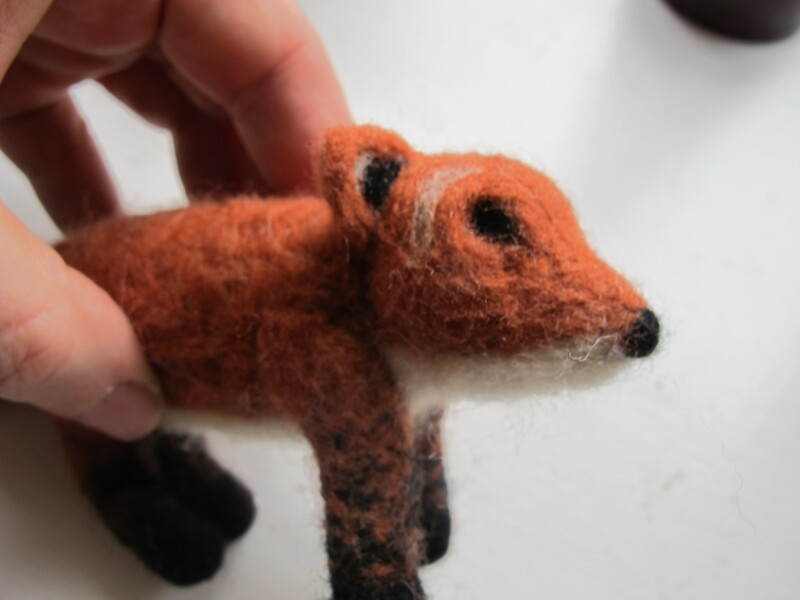 Pay close attention to felting the details — there is a moment when the felt starts to respond to each poke, allowing you to shape your creature’s character and look. 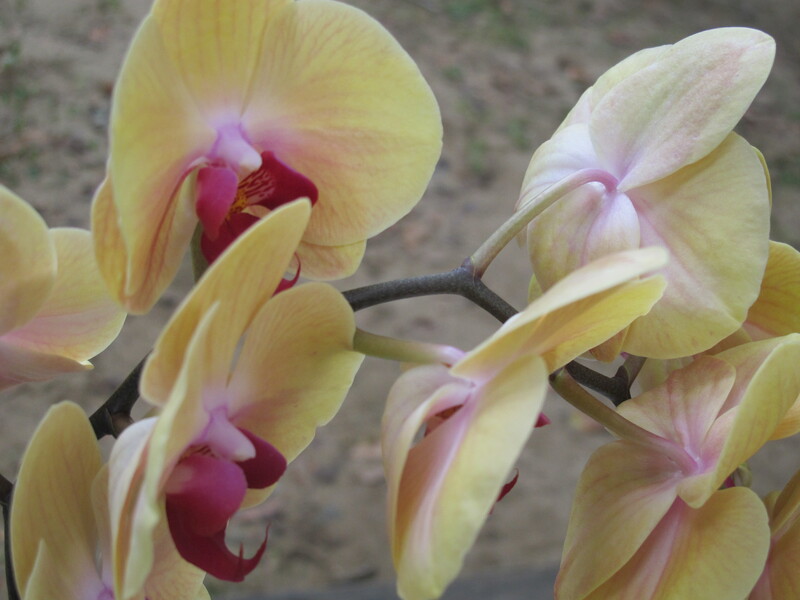 Don’t fret if things are perfectly symmetrical, as some differences add to the life-like imperfections. 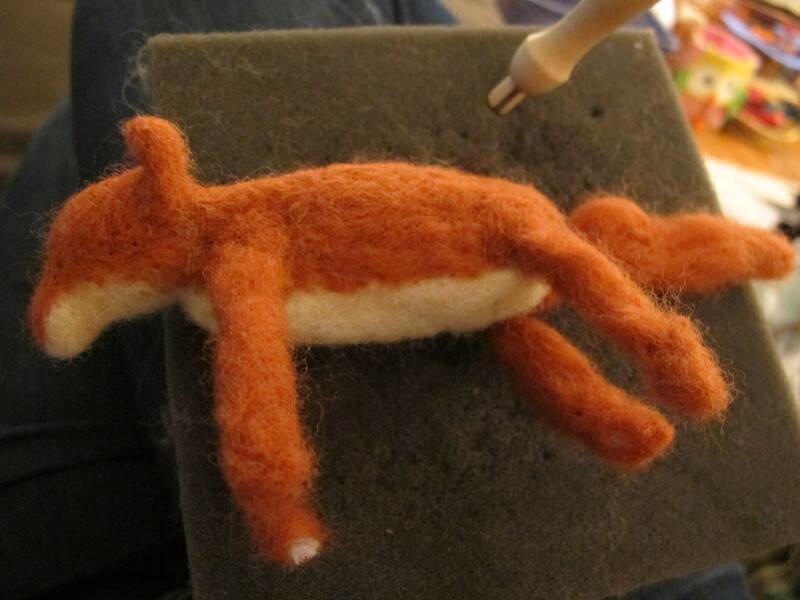 You can always attempt a more artistic version than I did — many of the most life-like needle-felted foxes on-line have more loose roving to mimic fur on top. 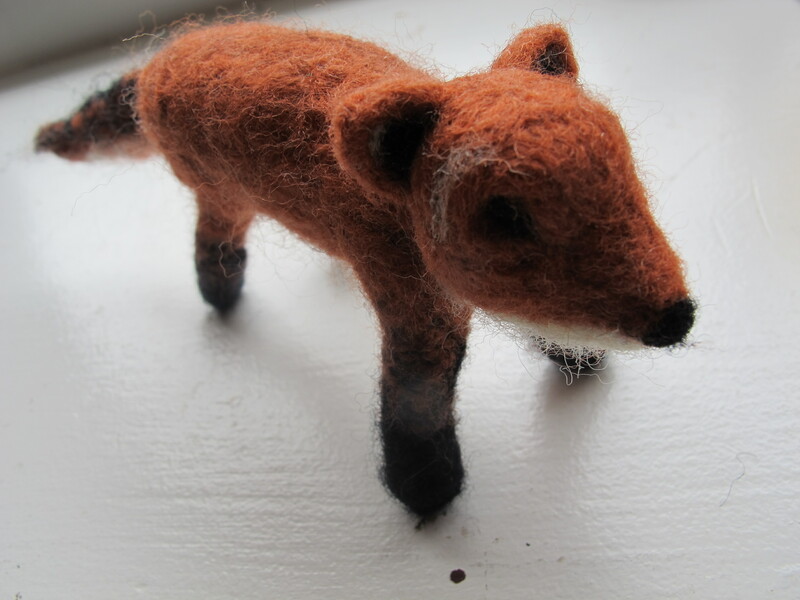 Since I intended it to take some damage as a toy, I made it more felted than this gorgeous artisan furball of a fox, for example. 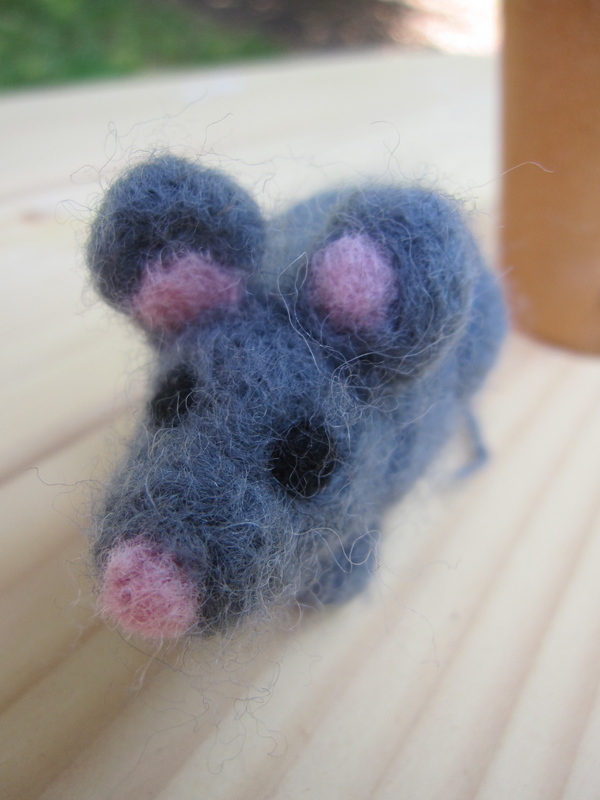 You can also get more fancy with adding small glass eyes from craft stores or on-line sources, as you wish. 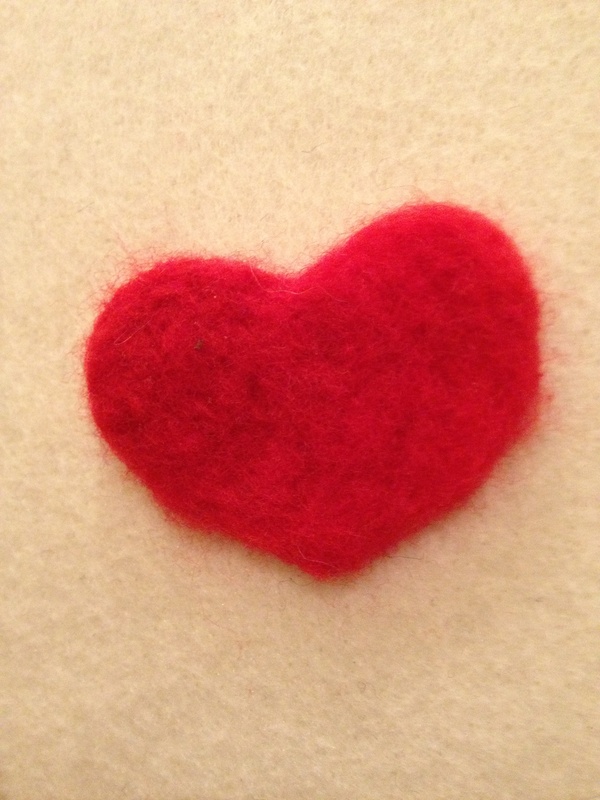 Needle felting is an inherently satisfying little craft, as I’ve mentioned once before. 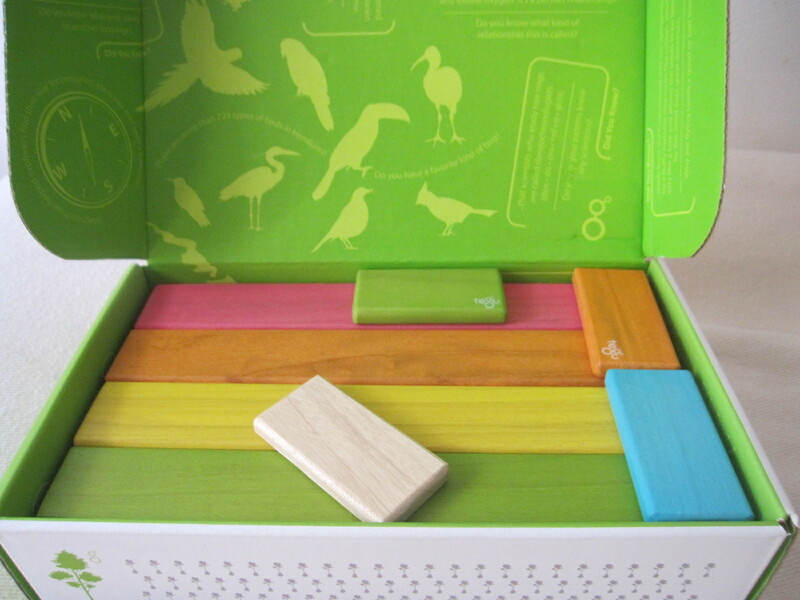 The materials are simple, the design principles easy to learn, and the results are wonderfully cute. 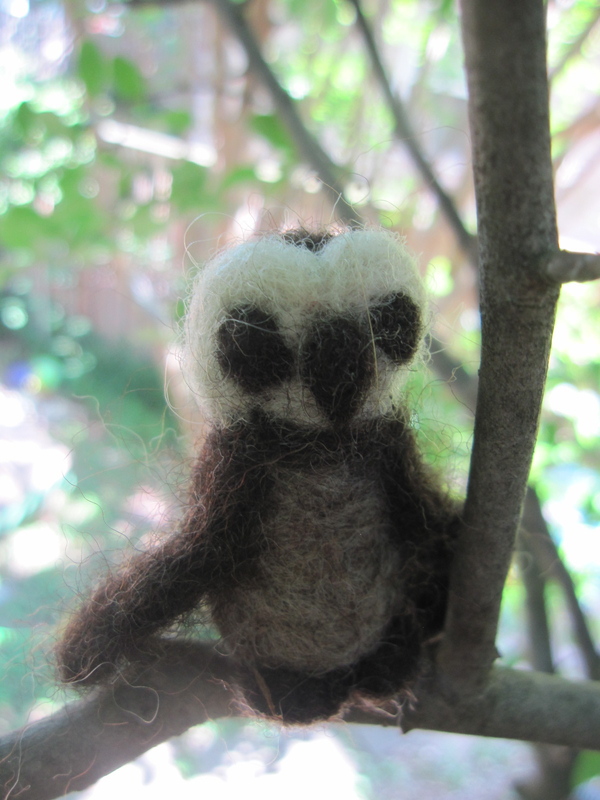 Of course, having handmade toys in the mix also makes your home feel more cozy. As a bonus, kids notice when you’ve put the effort in to make at least a few of the objects in their lives. 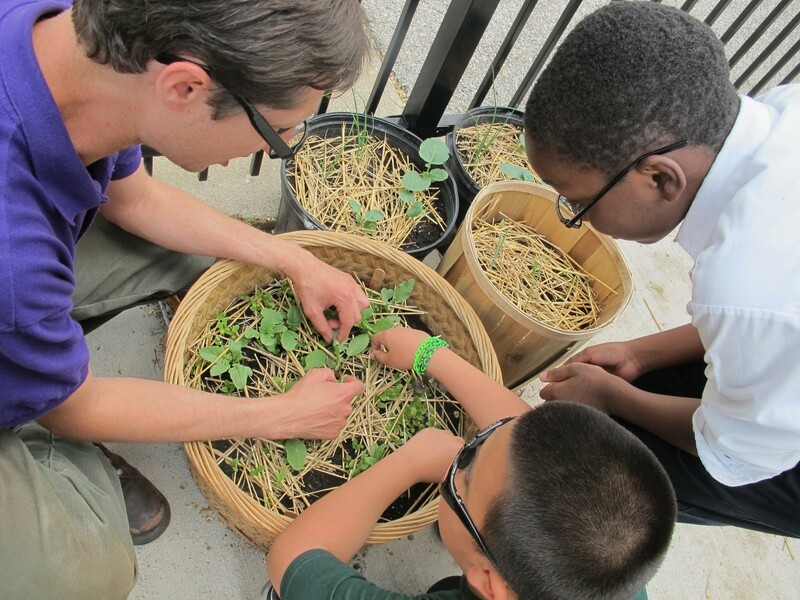 It gives them a sense that things in their lives can be an act of creation, not just purchases from a store. 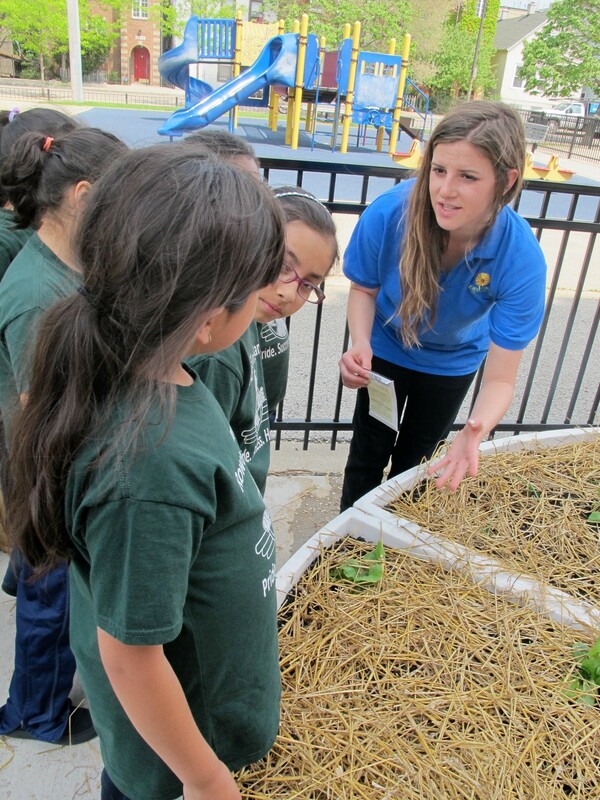 And it may even inspire them, someday down the road, to make their own toys, which could never be a bad thing. 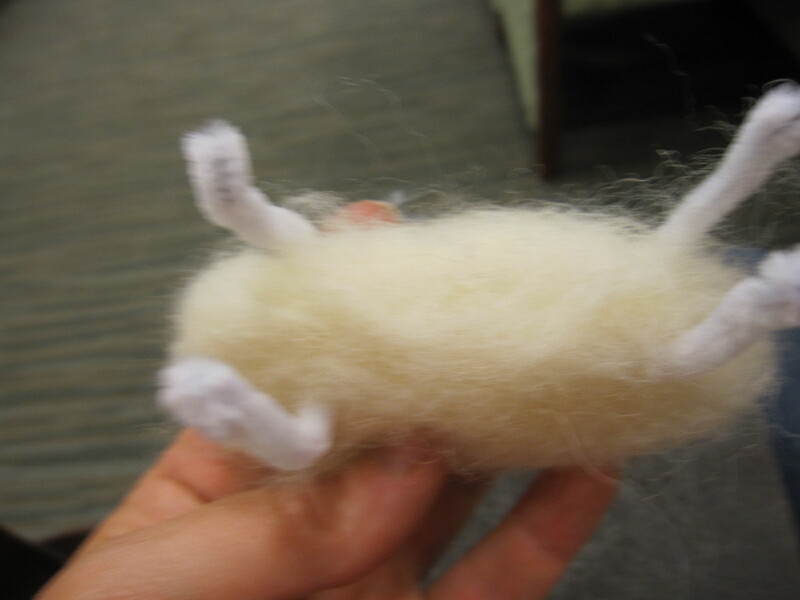 Below is a step-by-step guide to needle felting a sheep. 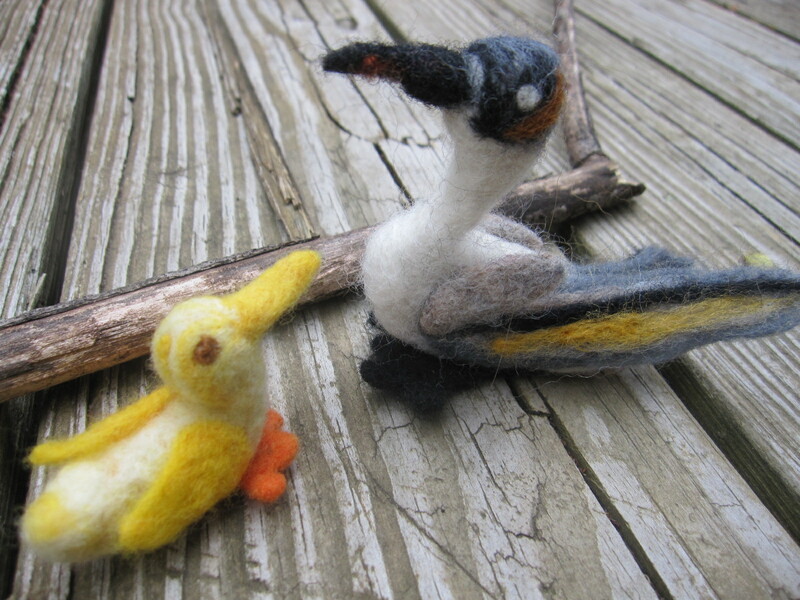 But the principles could be applied to make virtually any animal at all (like these in my prior post), which is another aspect of this craft’s creativity. 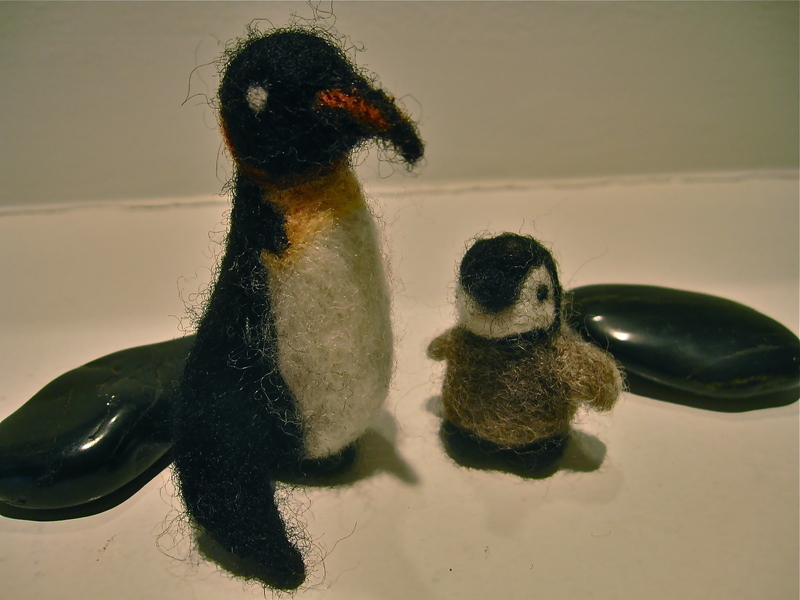 If you need more inspiration, there are wonderful felted animals and characters by crafters on Etsy (like here or here), or you could always check out a local wool and sheep festival. 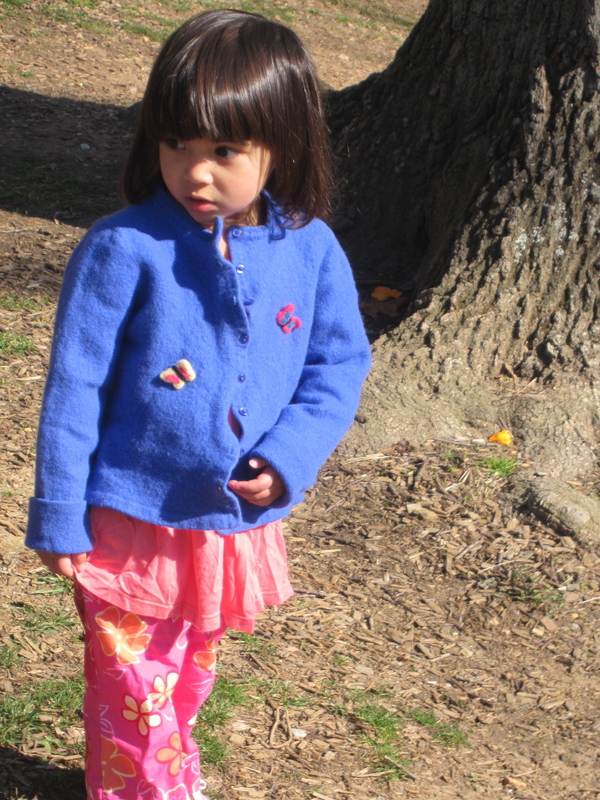 Our Maryland event last spring had a ton of vendors with lovely little creatures for sale. Two pipecleaners. White works well for this project. 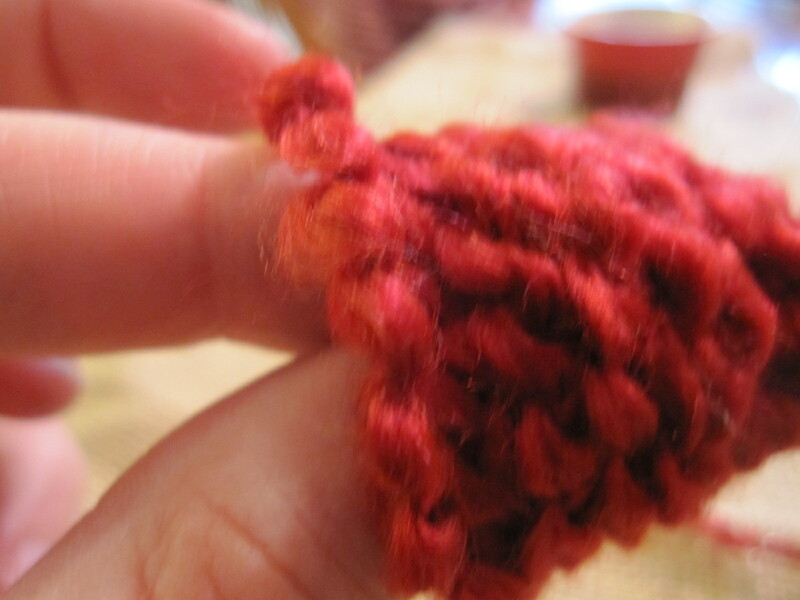 The other precaution is to try to keep from poking your fingers, as the needles are super-sharp. This does not keep me from doing it in front of the television, though, so some injury is likely inevitable. But the sheep is worth it. Kind of. Decide the dimensions. 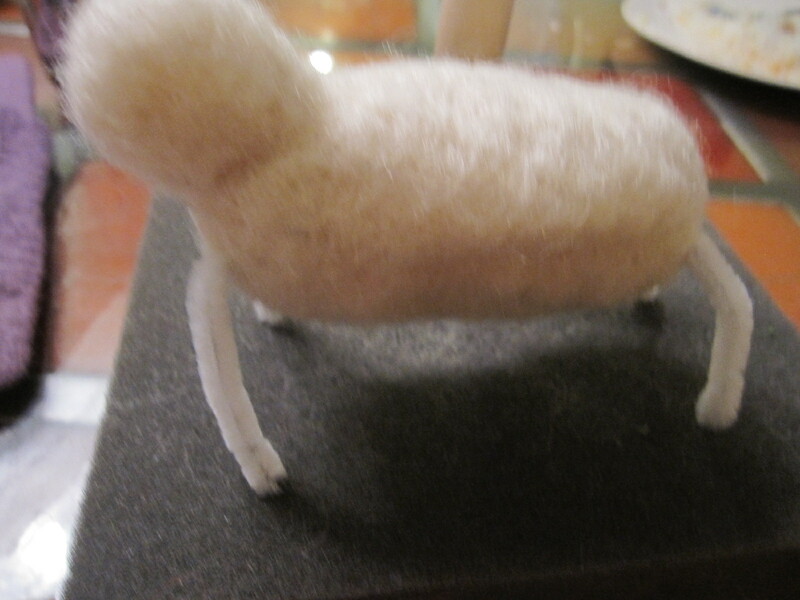 This sheep began with a ball of wool about 4 inches long and two inches across, and I wanted an animal about those proportions in the end, so as it became more compacted, I kept adding wool around it. 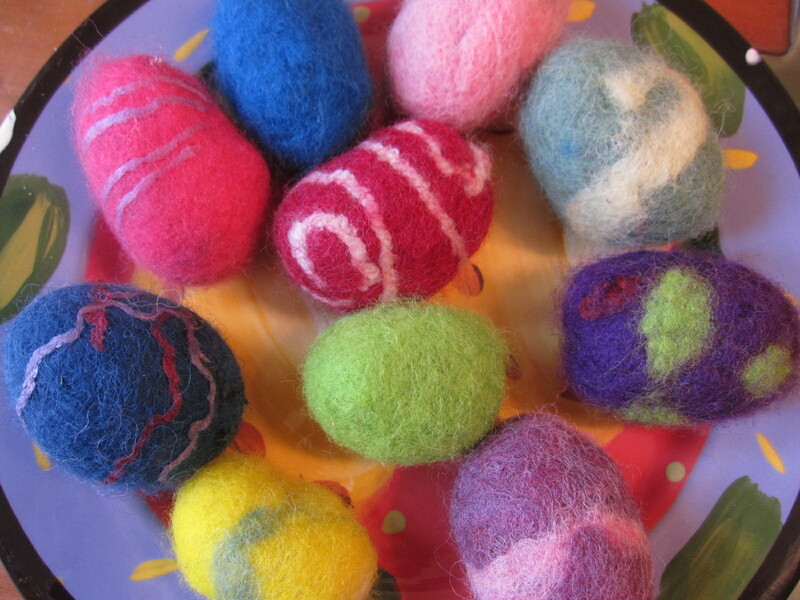 To save roving, you could also use wool batting in a ball on the inside, or even old balls of yarn, tightly wrapped, and wrap the cream colored roving around it by laying it out flat first and folding it around the ball, as I do with the Easter eggs here. 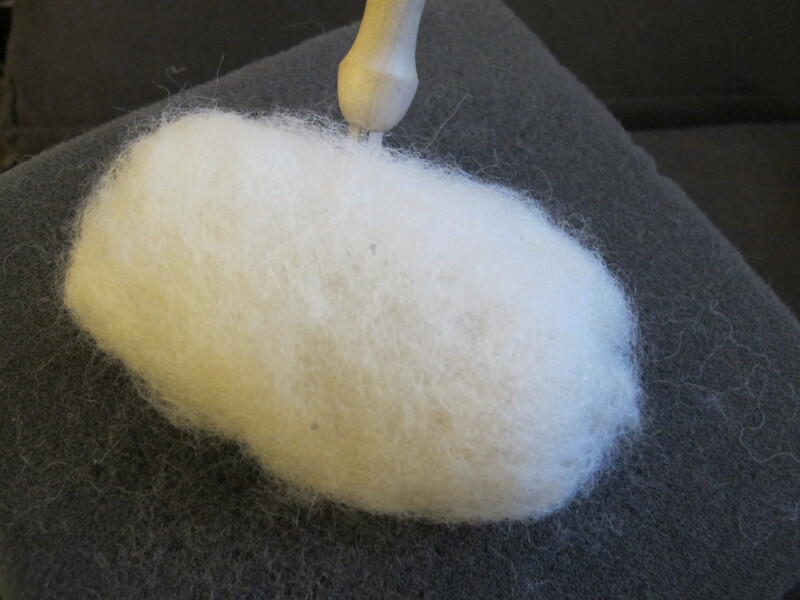 Poke the ball of wool with a needle (larger number needles or a multi-needle tool works well for this early stage). 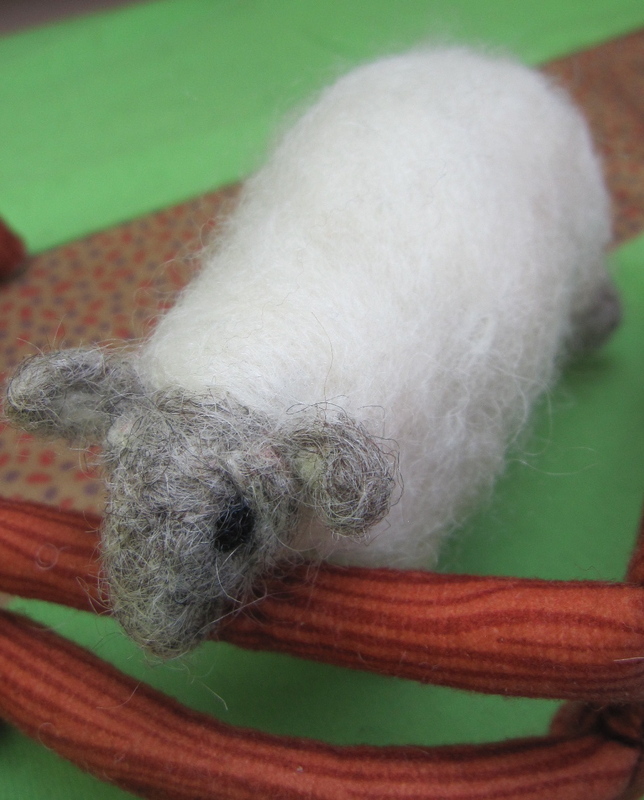 Turn the wool over and over to maintain the shape evenly and keep it oblong. 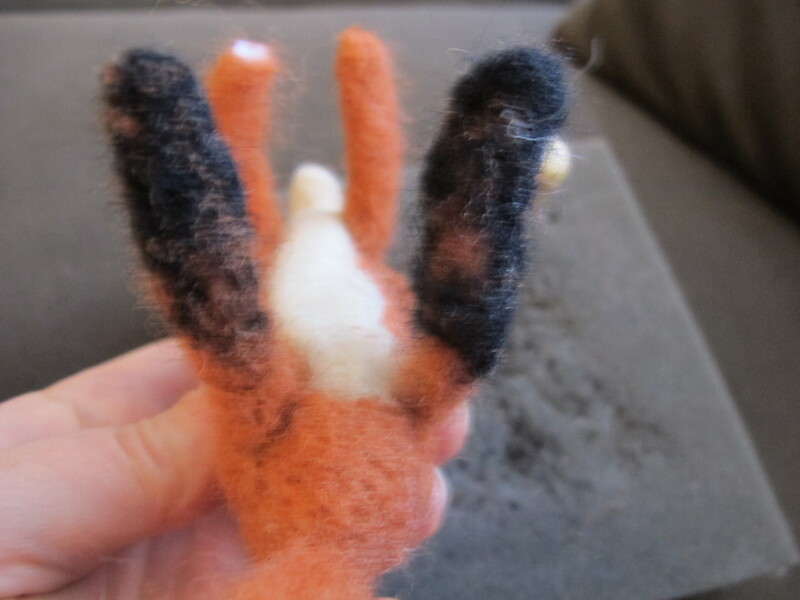 Push on it with your finger to determine how felted it is becoming and measure the springiness, to keep it roughly even. 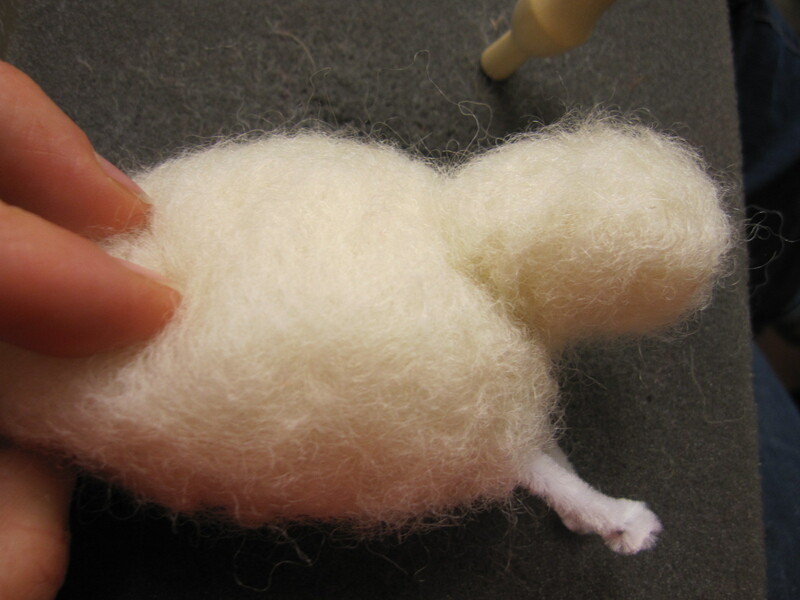 Once you have a nice shape formed, but before it becomes too tightly felted to create too much resistance, poke two pipecleaners through it at the front and rear ends of the sheep, which will form the basis for legs that allow it to stand up. Trim the legs with sharp scissors or wire cutters so that they are even and fold over the sharp ends slightly to form the beginnings of feet. Stand it up to see whether it works, and adjust as necessary. 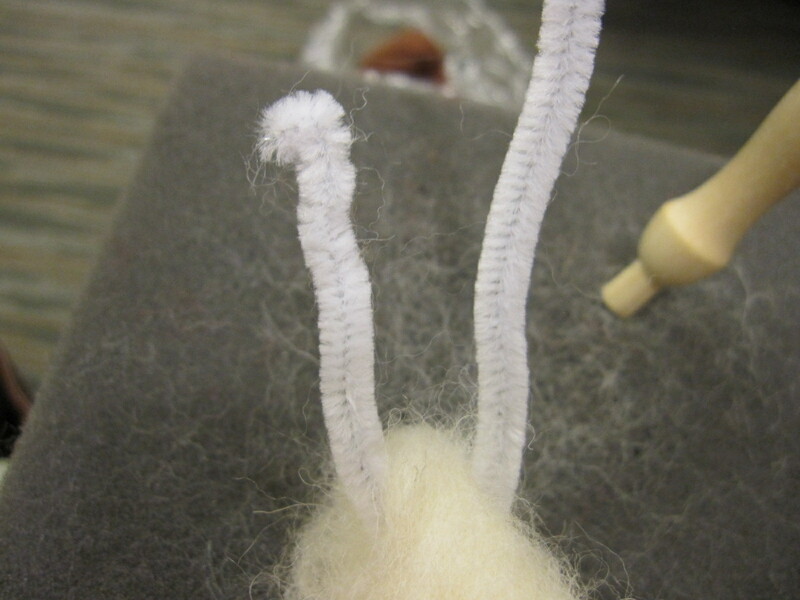 The pipecleaners may not be of exactly identical length, because where they go through the shape may require more or less of the pipecleaner to be inside the body of the sheep. 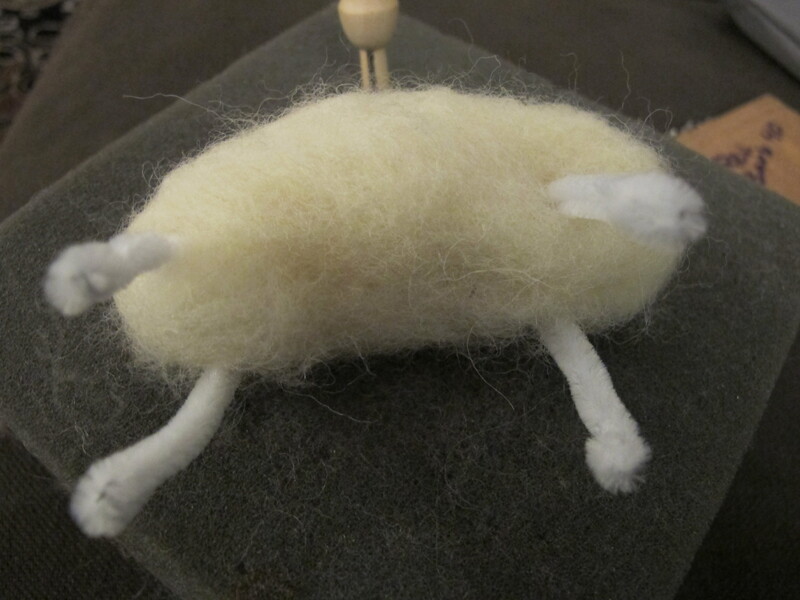 Wrap additional roving around the sheep to add bulk and secure the legs inside the body. 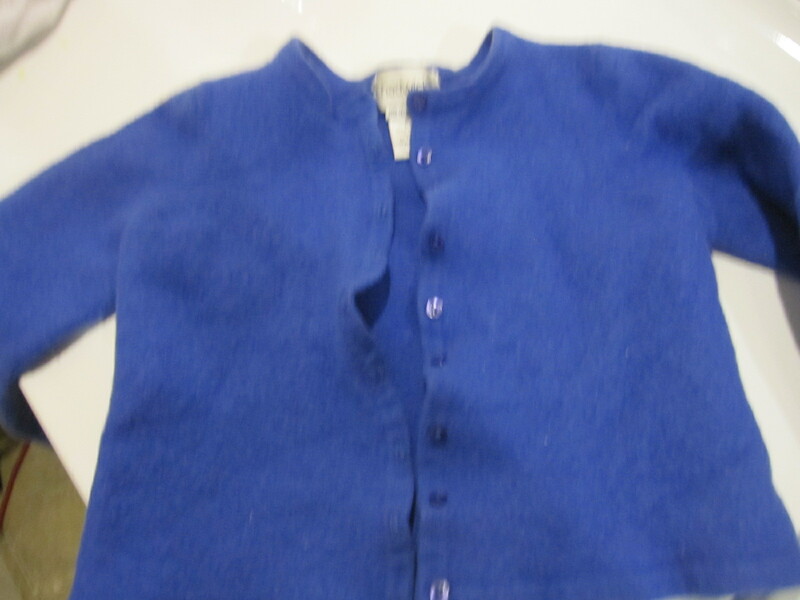 Poke and shape with your needle until the new wool is integrated, but leave what will become the neck area less worked than the body as a whole. 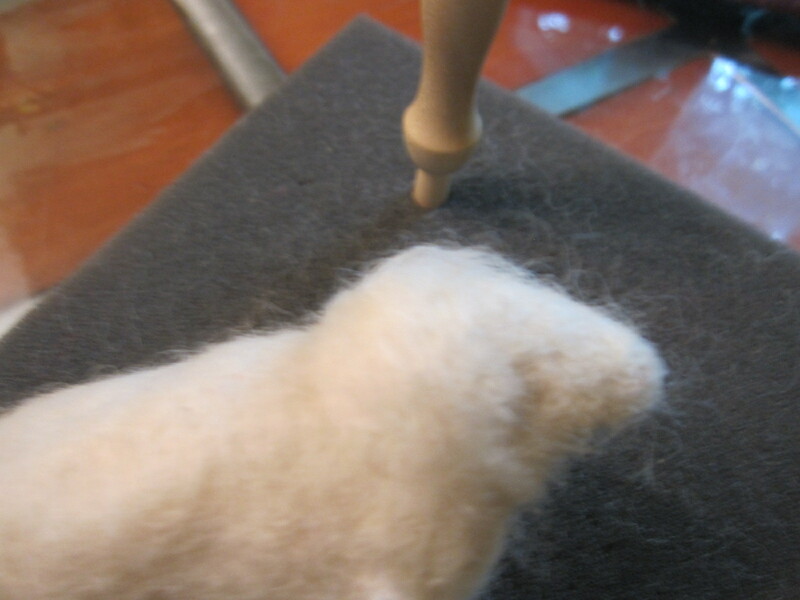 Rolling a small ball the right proportion for the head, add it to the body where a neck should be and secure it by poking the edges together with a needle. Form the head, which on sheep is a bit oblong, and further shape the body. I find it helps to refer to pictures of the animal on line for details like head shape, which are critical to recognizing the animal. Once the basic form has been created, shape the head into a triangle to form the nose and angle the shape towards a blunted point, adding more roving as you need and poking aggressively to flatten the sides. 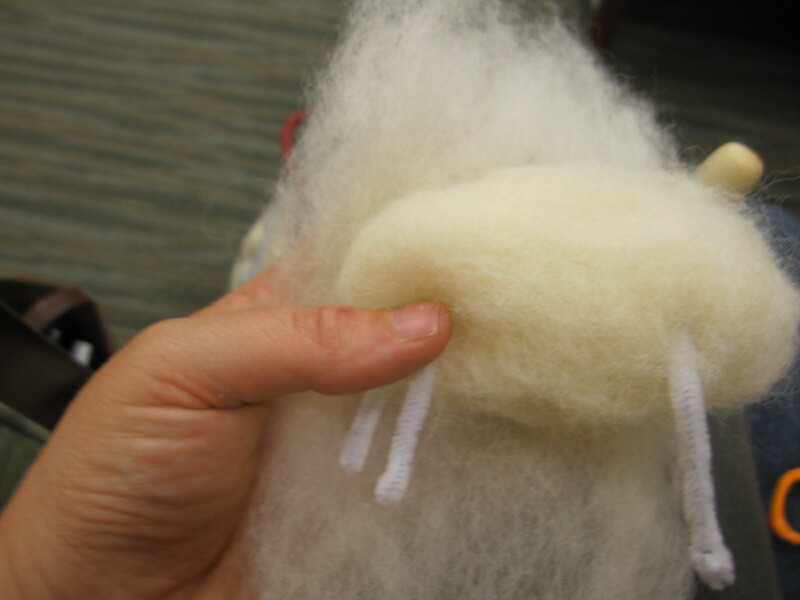 Finish forming the head and neck, which on sheep I found requires a ring of additional roving around the back of the head and through the neck, which is thick but distinct. Add gray to the front of the head. 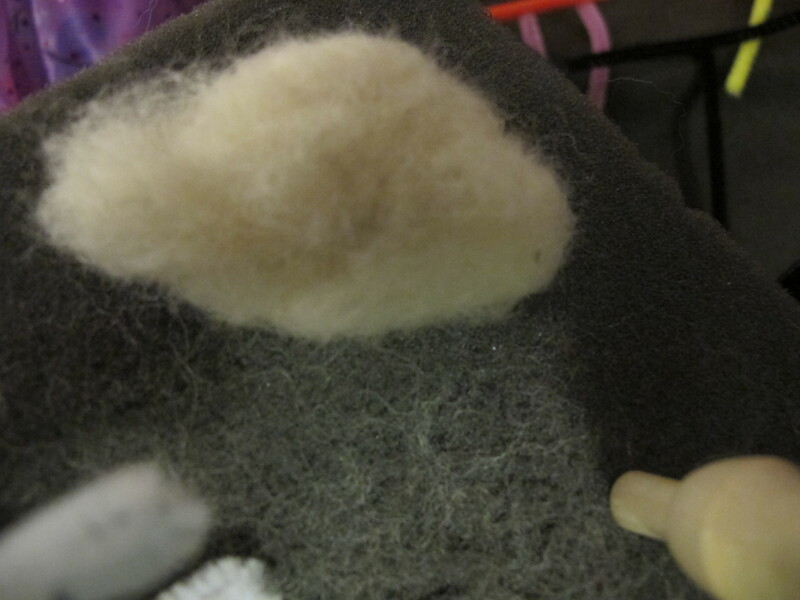 Separately felt small circles the size for ears in grey wool, leaving one edge unfelted. 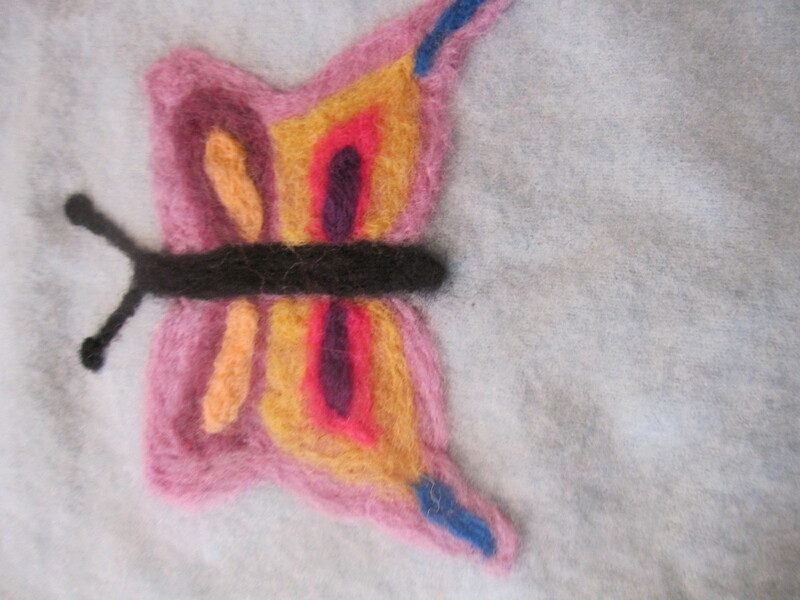 Attach to the end to head at the two top corners and secure by poking with the needle. 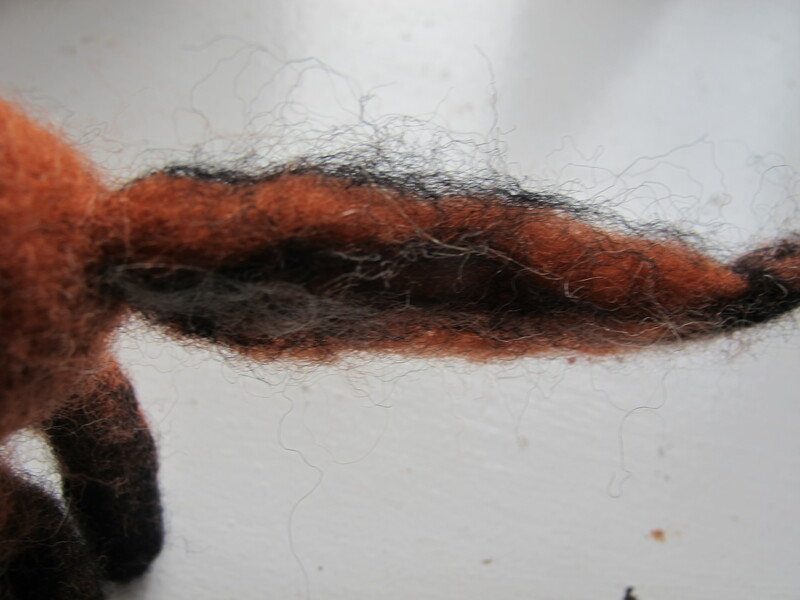 Then flatten a handful of roving, aligning the fibers, and wrap the legs, poking through and around the pipe cleaner and trying to avoid the wire. 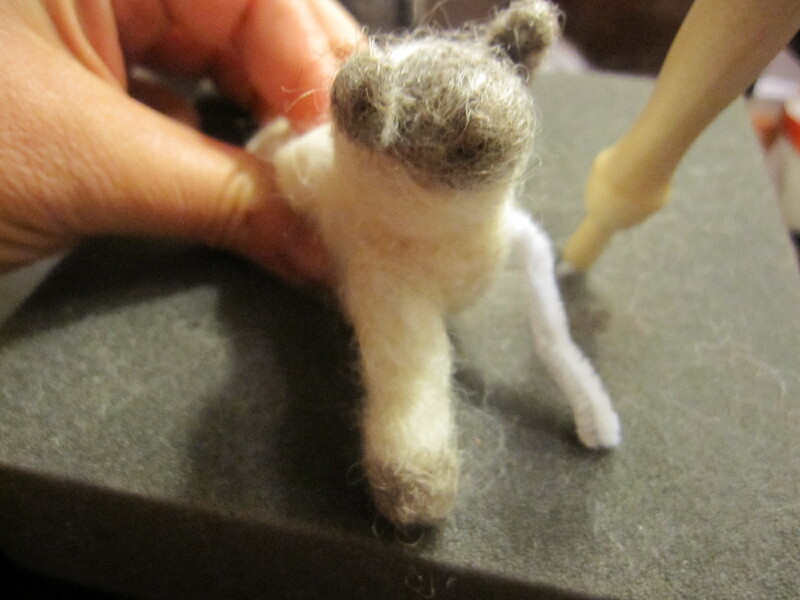 Add grey to the end when you are satisfied that the leg is thick enough. Repeat for each leg. 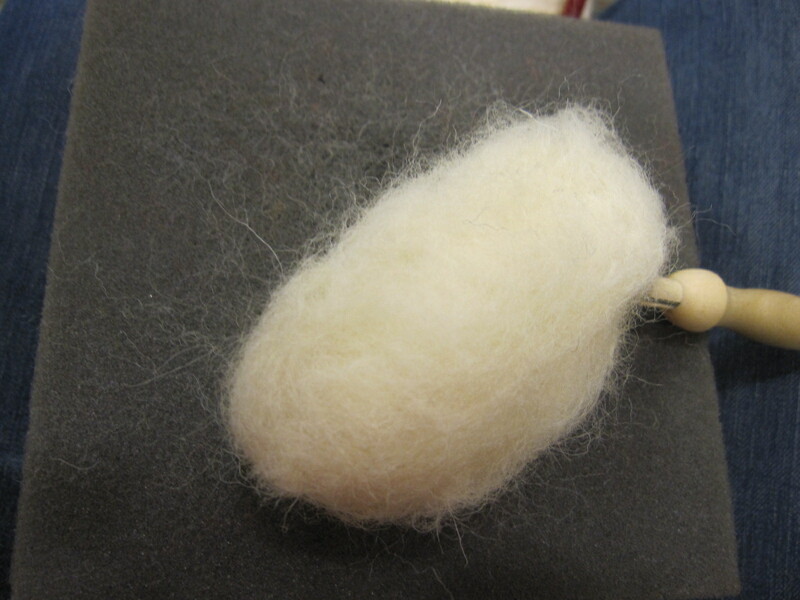 Needle in two small balls of black roving for eyes, poking with the needle in the same spot over and over to keep them medium-sized. 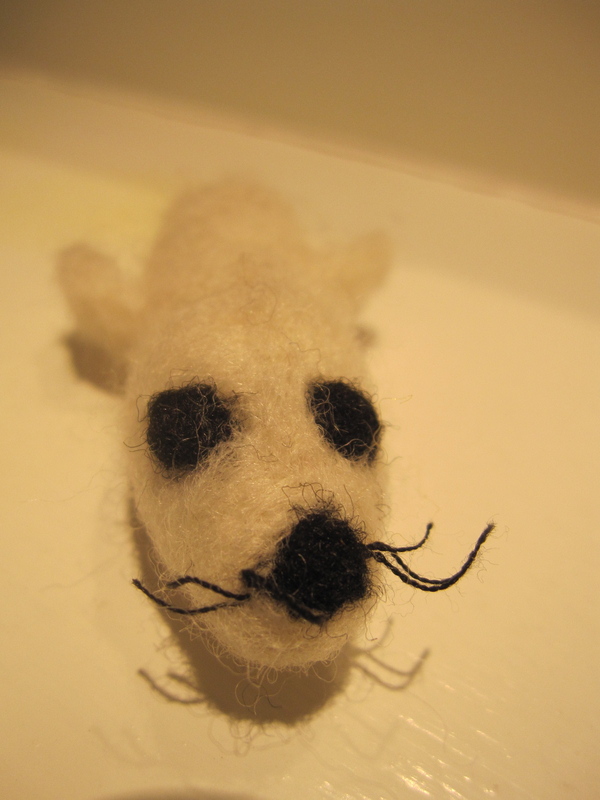 You may also want to add, as I did, some additional small amount of gray felt to make a ridge above the eyes to make them appear deeper-set. 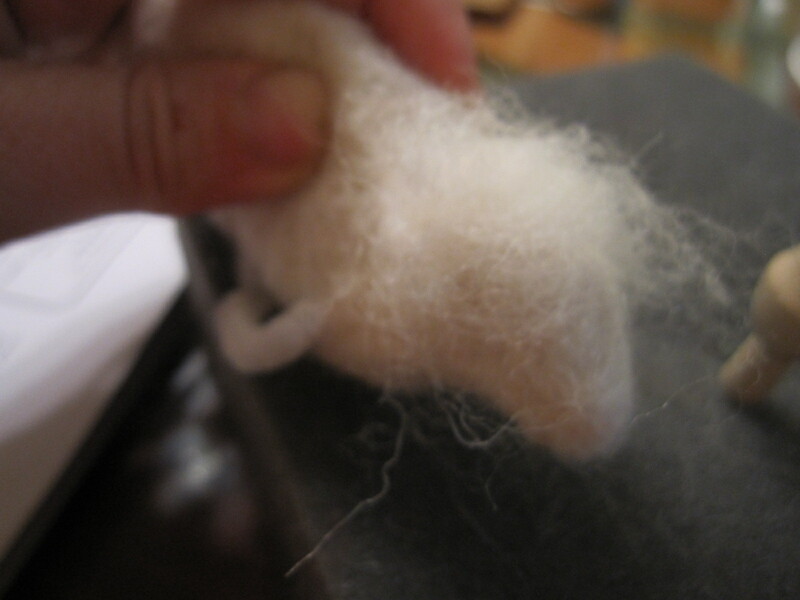 Then add small tufts of white to the inside of the ears if you like, putting the sheep on its side and the ear against the block. 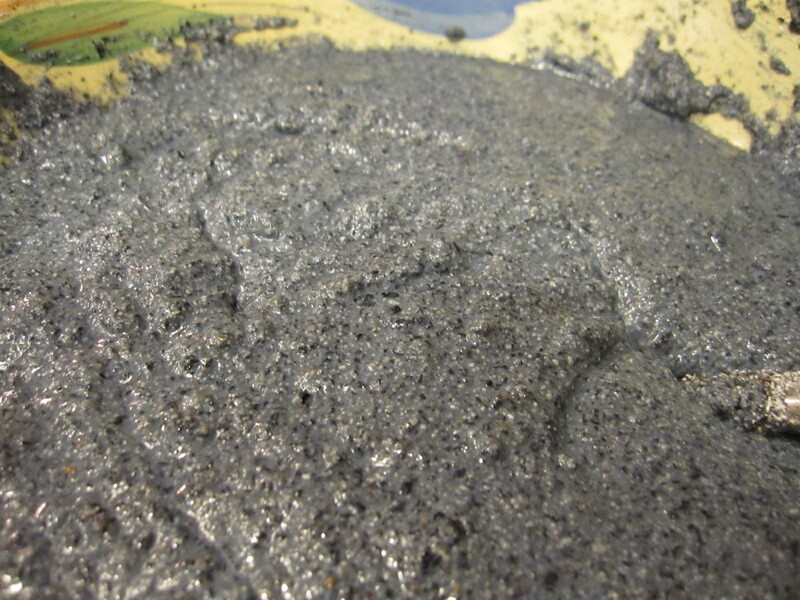 You may need to add a small amount of gray to the back to thicken the ears if the white shows through. 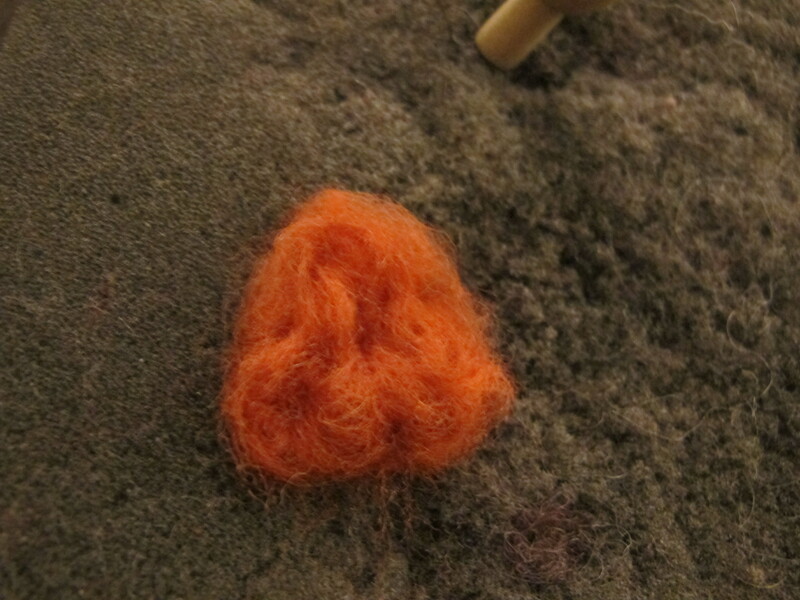 Then, add a tail. Sheep actually have a natural tail that is long with a stringy end like a horse, but these are often docked on farms so a triangle is also fine. 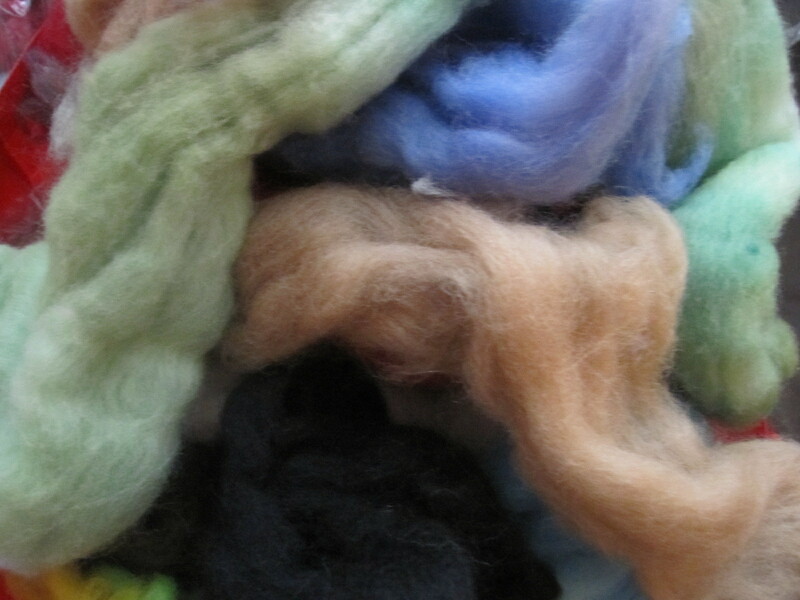 Last, evaluate and wrap and fill in extra roving to really fill out the body and create more bulk. 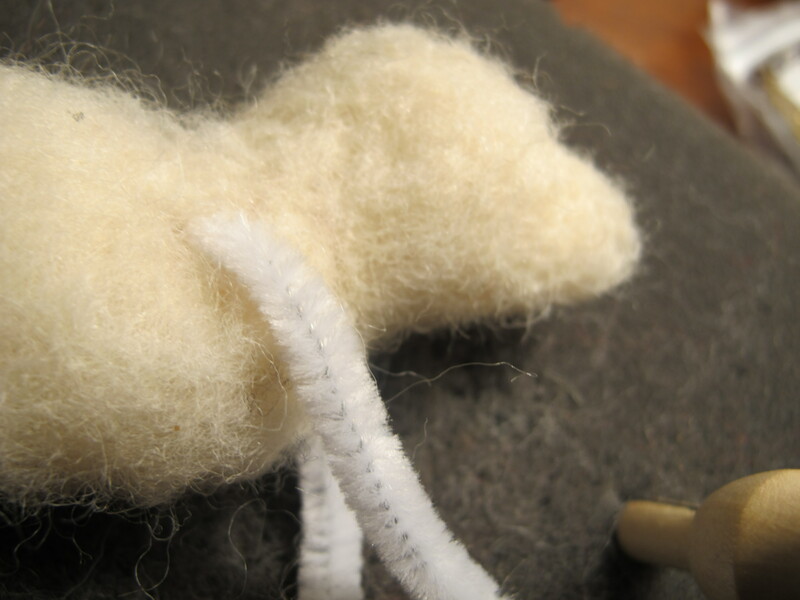 For the top coat of wool, leave some parts less felted in order to create a fluffy look. 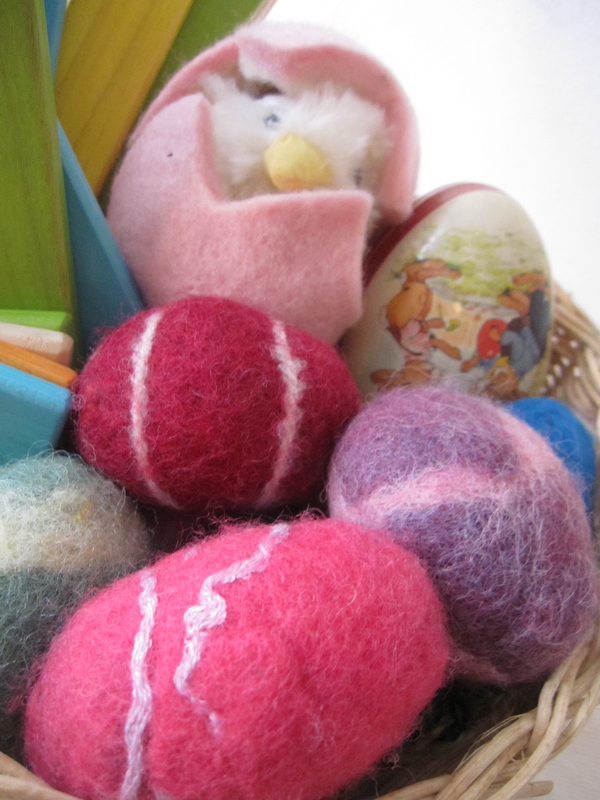 This year, I eyed Easter on the calendar and decided, as is my wont, to de-plastic and unjunk the basket. 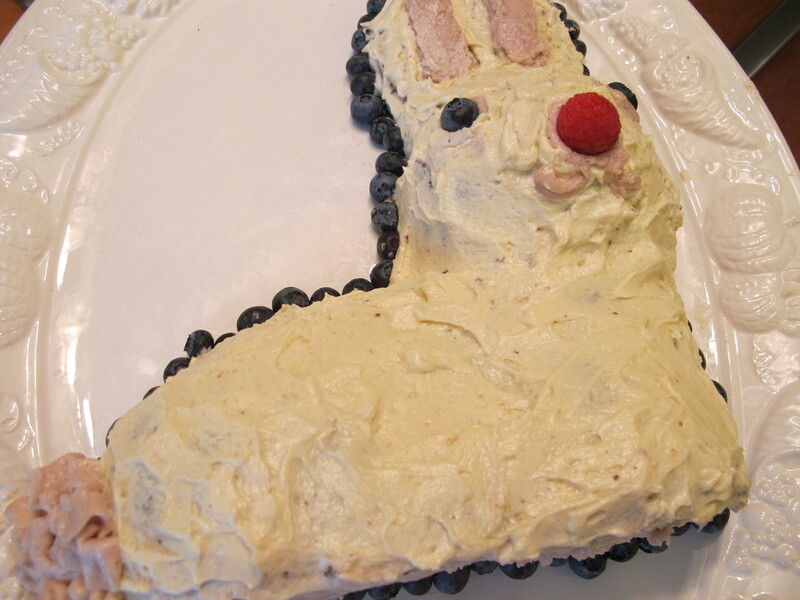 No Peeps for us peeps. And none of that irritatingly static-y plastic grass, which is a pointless use for various poison plastics (including PVC), if I ever saw one. I found a spare basket at the thrift store for .60 cents, rounded up green shredded paper (though paper from the actual shredder or a little tissue paper would work just fine), and picked up a few small but adorable toys from the stuff sold by Maya’s new Waldorf school, including this cute egg made by Fairyfolk and a chick finger puppet inside from Folkmanis. 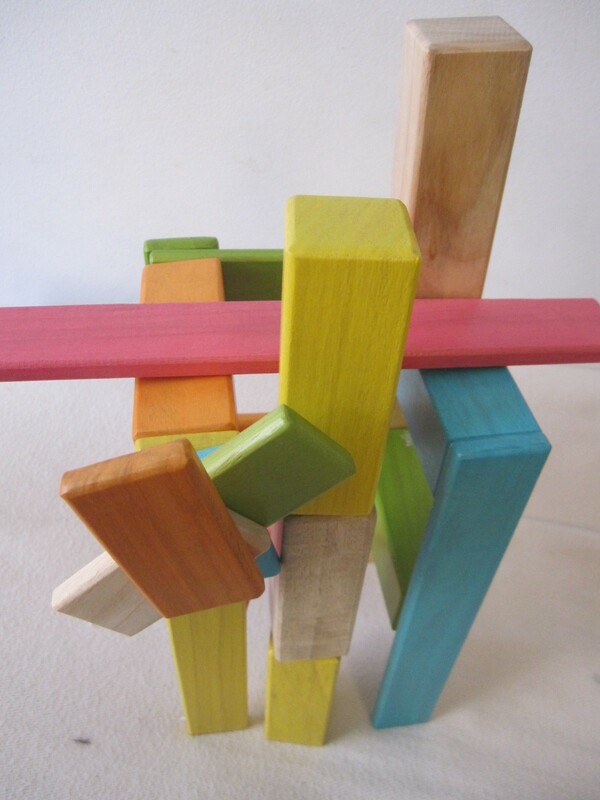 I also allowed myself to finally buy these long-coveted pastel Tegu blocks, ostensibly for Ms. M, but really for me to play with. We’re planning on dying eggs, of course, using this natural, food-based dye from Earth Paint, and decorating them with these smooth-as-silk and high quality beeswax crayons that the great mom who runs Stubby Pencil studio just sent me to try. But that seemed predictable, somehow. 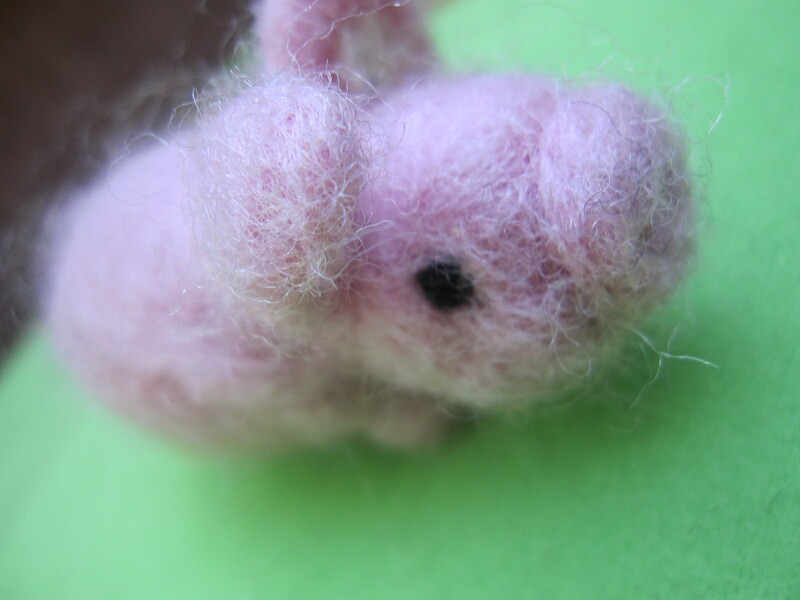 So I decided to take it up a notch by making felted Easter eggs last Sunday morning. 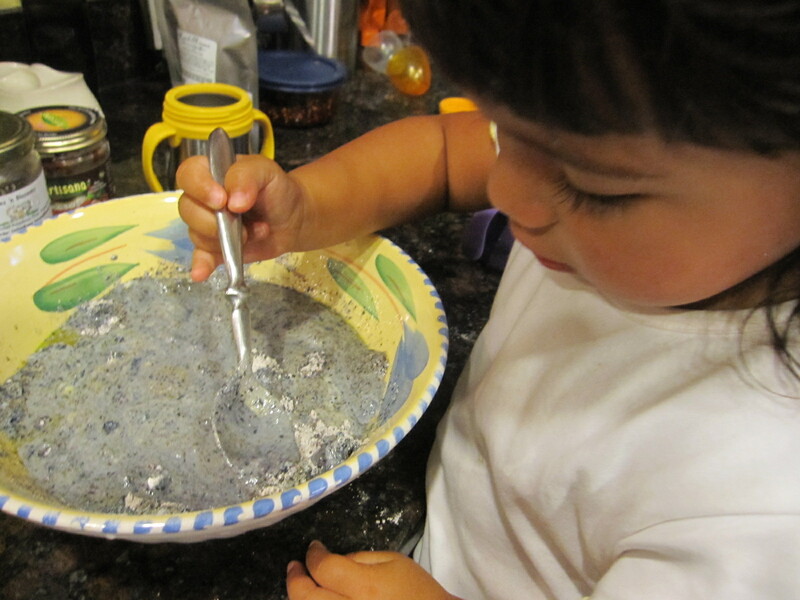 I’m pleased to report that this is totally the kind of project that is fun and manageable for a toddler, and that the only messiness involved is some soapy water, which is hardly a problem. 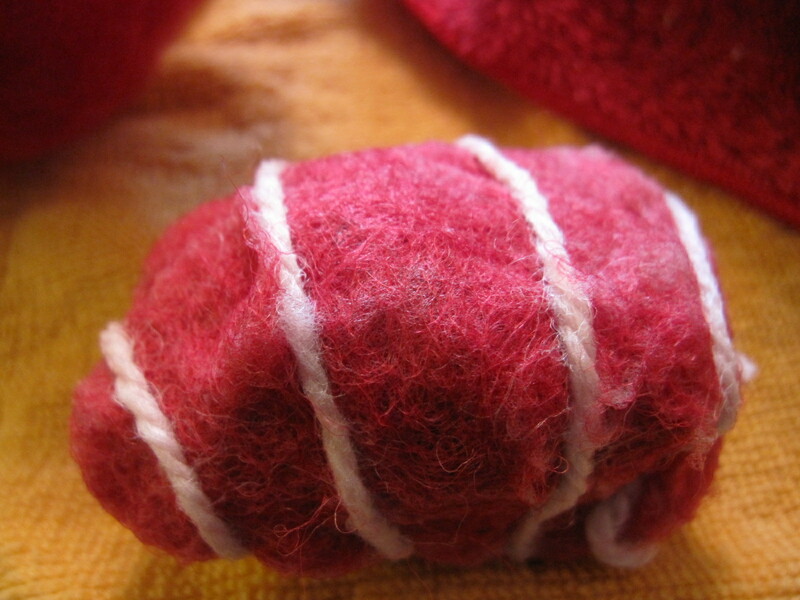 First, set up your soapy water in a bowl on top of a towel and make your “egg” base with yarn by wrapping the yarn thickly around two fingers held together, then slipping it off and wrapping in the opposite direction to produce an oblong shape, until it is large and thick enough to form an egg even with some shrinkage. 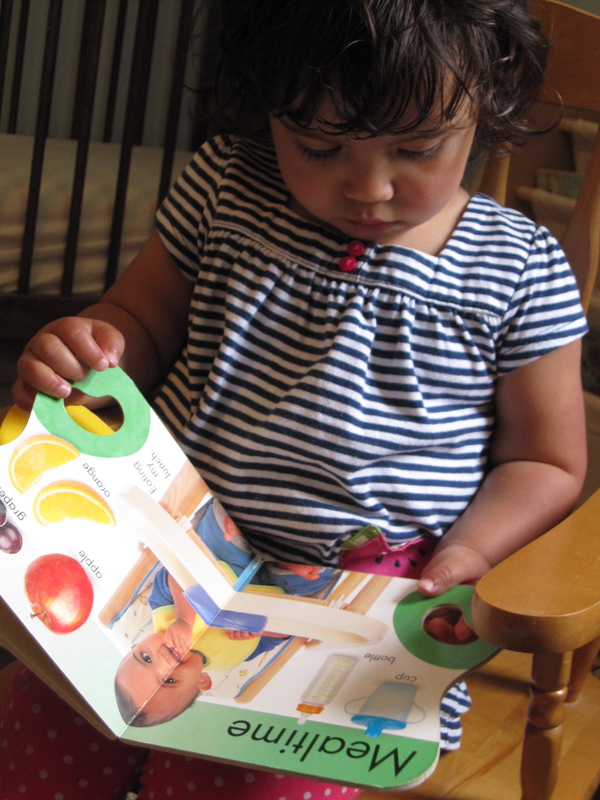 The toddler can help with this process as well. 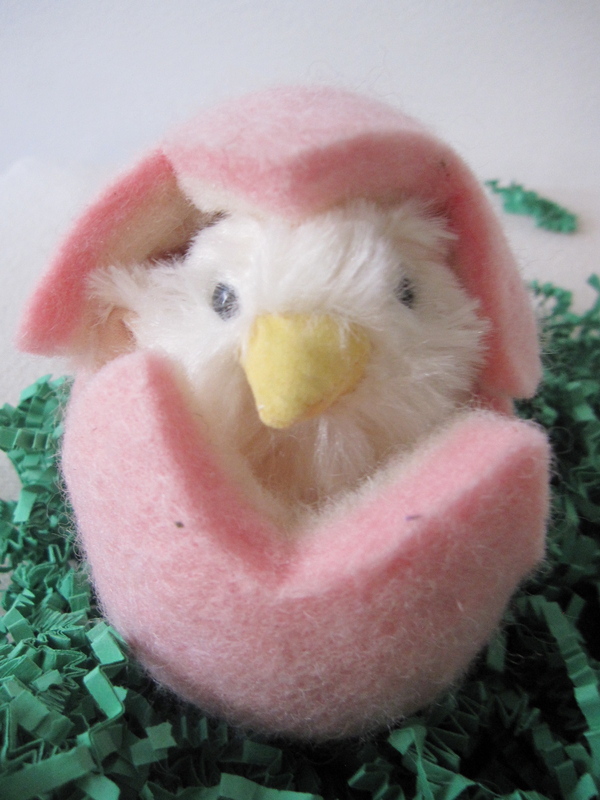 Dip the egg baby into the bowl and squeeze to start the felting process. 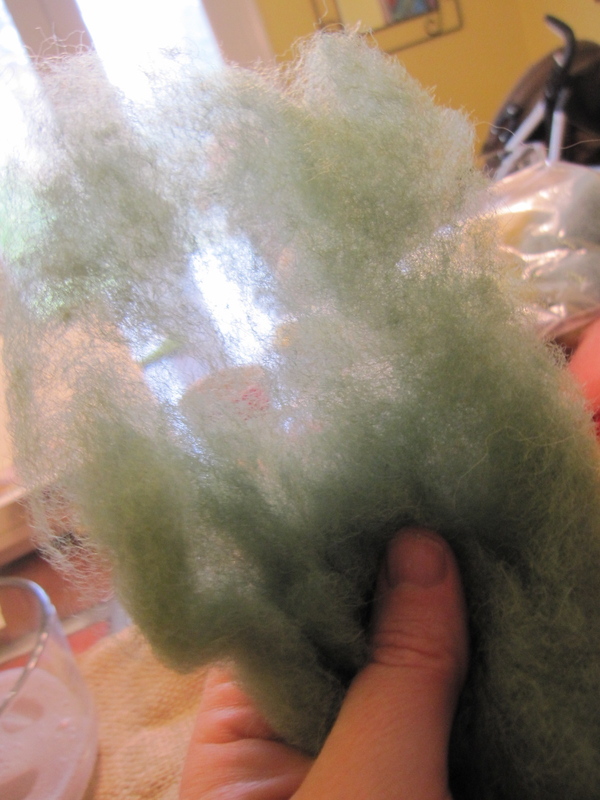 Next, grab a clump of roving wool and gently pull out some felt strands, flattening them a bit. 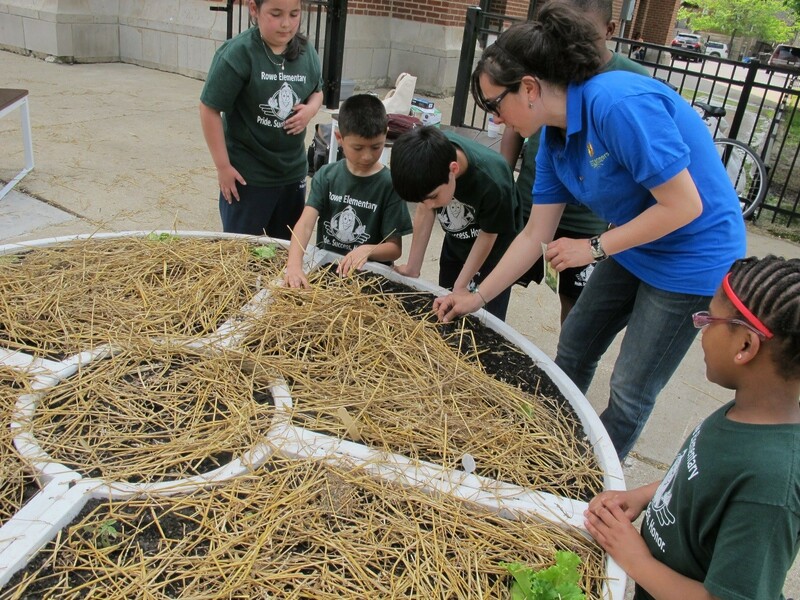 Wrap the egg in the roving. 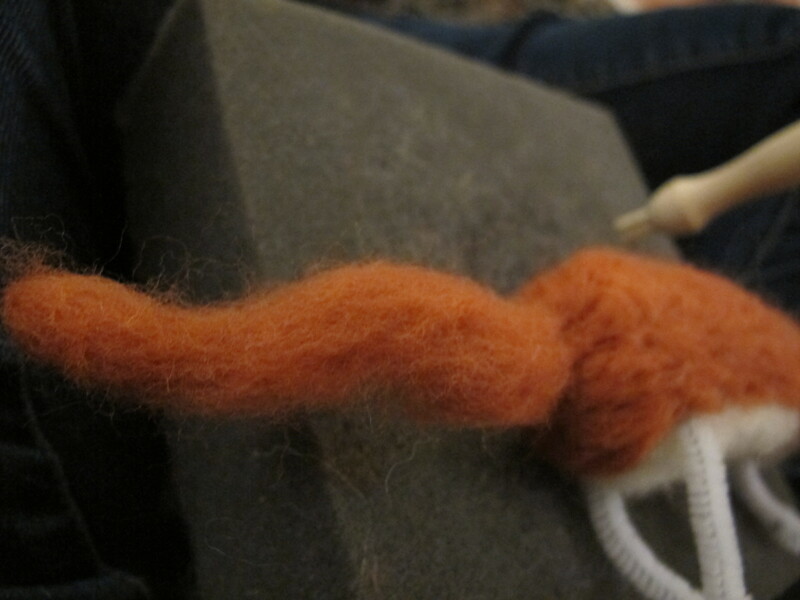 Next, wrap a second flat handful of roving around, with the fibers pointing in a perpendicular direction to the first batch (this is not nearly as hard to do as it sounds). 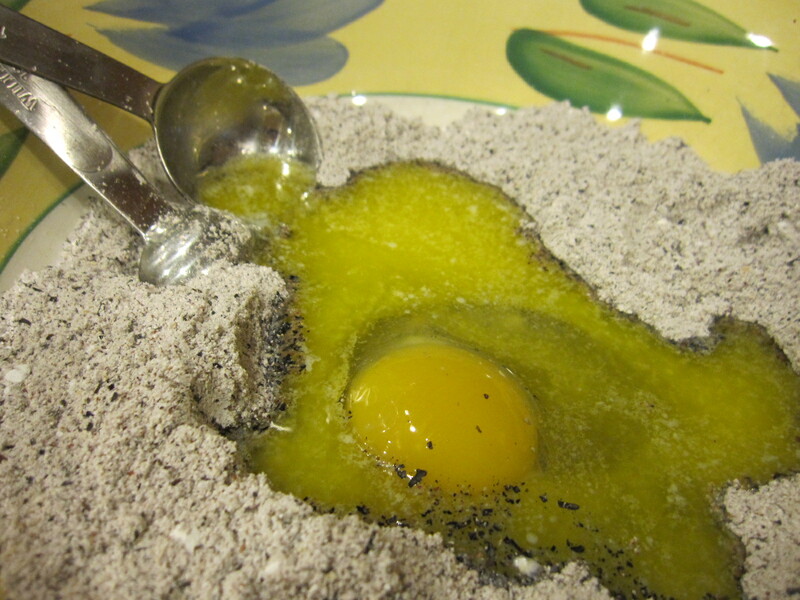 Dip the ball and get it good and wet, forming it into an egg shape. Decide what decoration you would like. 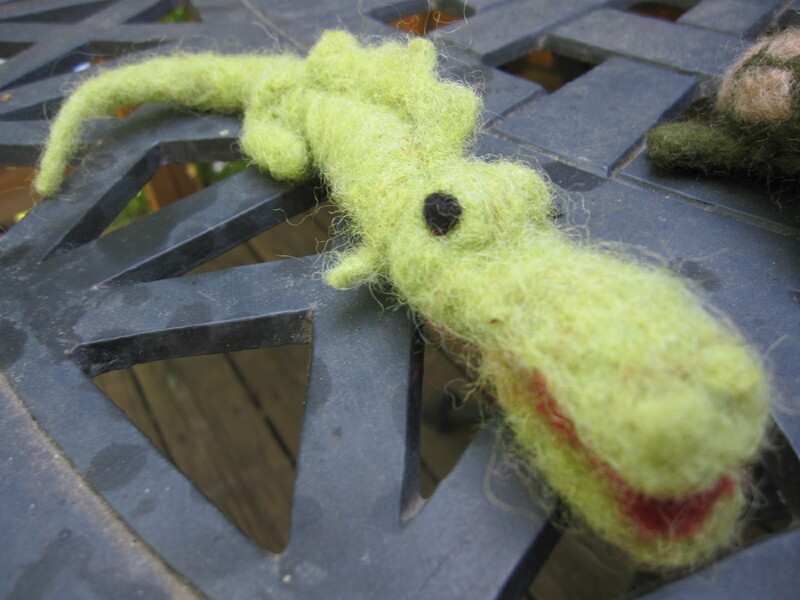 For this one, we used a little yarn. 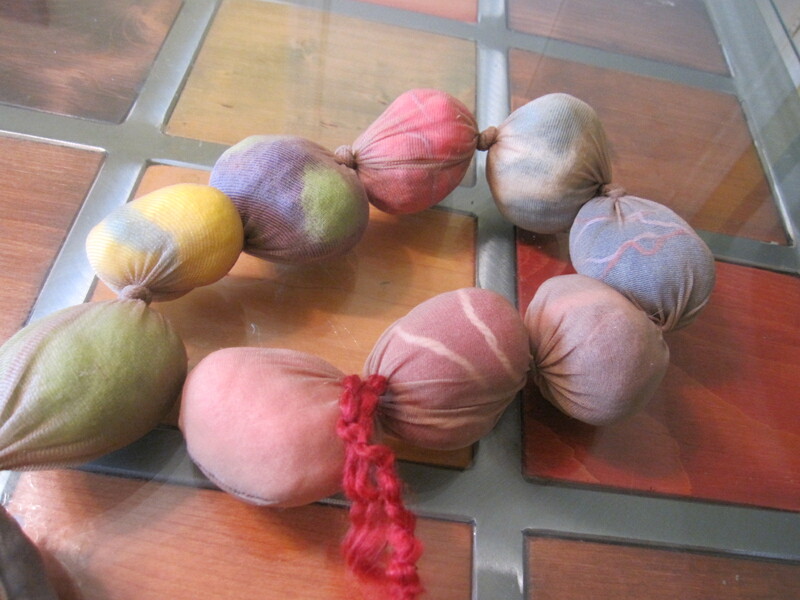 You can also do stripes or dots with different colored roving, use multiple colors of roving to make the egg, or wrap embroidery thread around as well (as in the picture up at the very top). 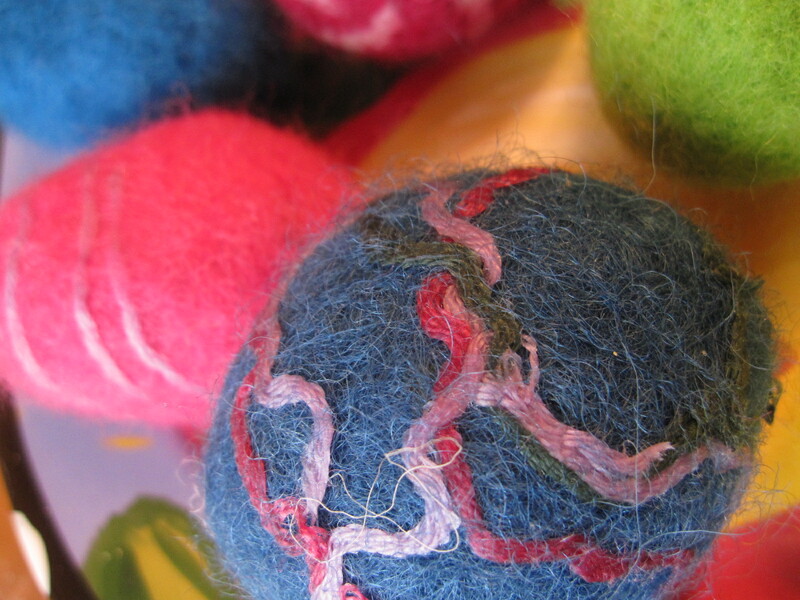 When you’re done making your eggs, stick them in the washing machine on a hot setting with the tennis balls if you have them around and some soap. Check them to see if you want more than one cycle (I did mine for two), and toss them into the dryer when you are happy with the shape. 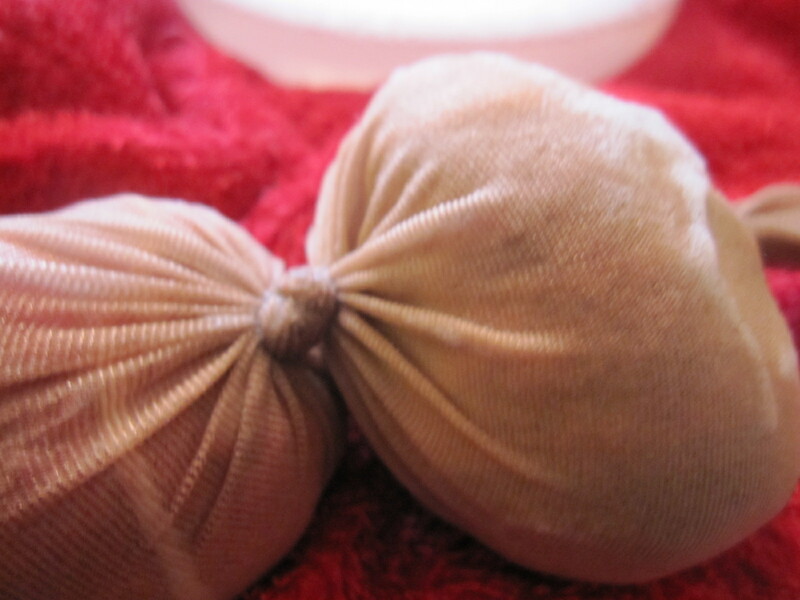 Dry them until no water comes out when you squeeze, and then you may want to put them in the sun to ensure they will really get dried out. 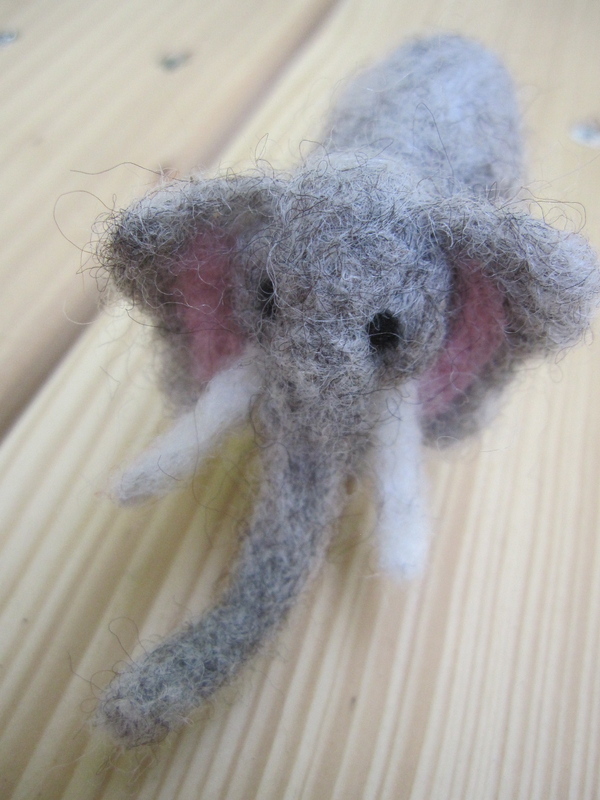 You could also sew embroidery, beading or decorative thread and ribbons on after the fact for additional cuteness. We’re kinda, sorta’ gluten minimalists around my house these days. It just seems like wheat (or the kind of wheat we all mostly eat) is getting a much-deserved hard look, and the picture isn’t pretty. Cutting out wheat (mainly) also happens to rid us of some, though not all, of the empty, low-value calories in our diet, so that works nicely. 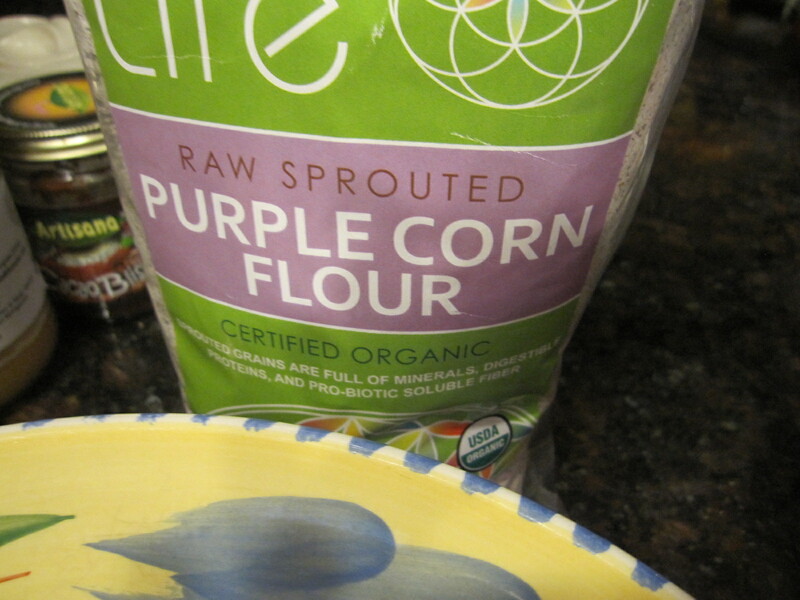 In addition to ordering some Einkorn wheat flour (which is a varietal of wheat most folks ate before the new, easier to grow and less healthy, kind became the norm), I’ve been experimenting with alternatives. 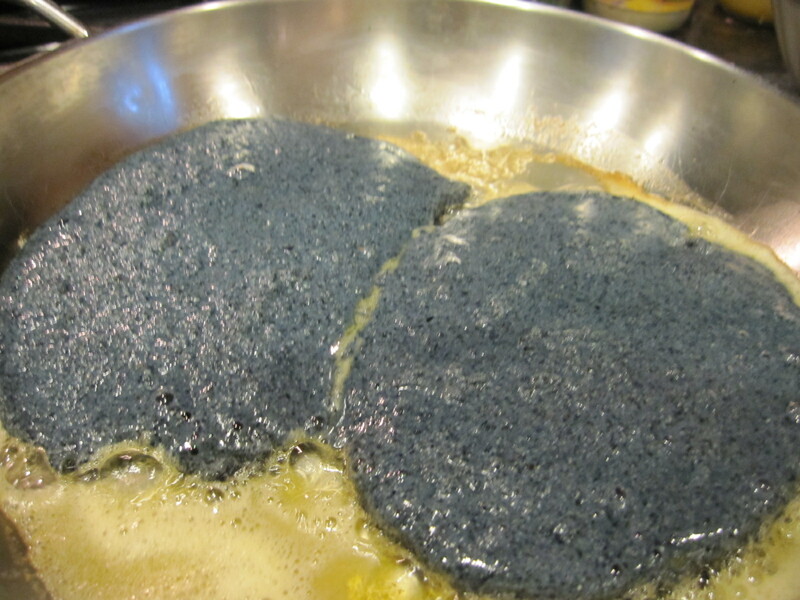 More successful were these wonderfully vibrant sprouted blue corn pancakes, loosely resembling southern Johnny Cakes, and based on this simple pancake recipe. They fluffed up for a breakfast worthy of royalty, in shades almost too purple to eat. 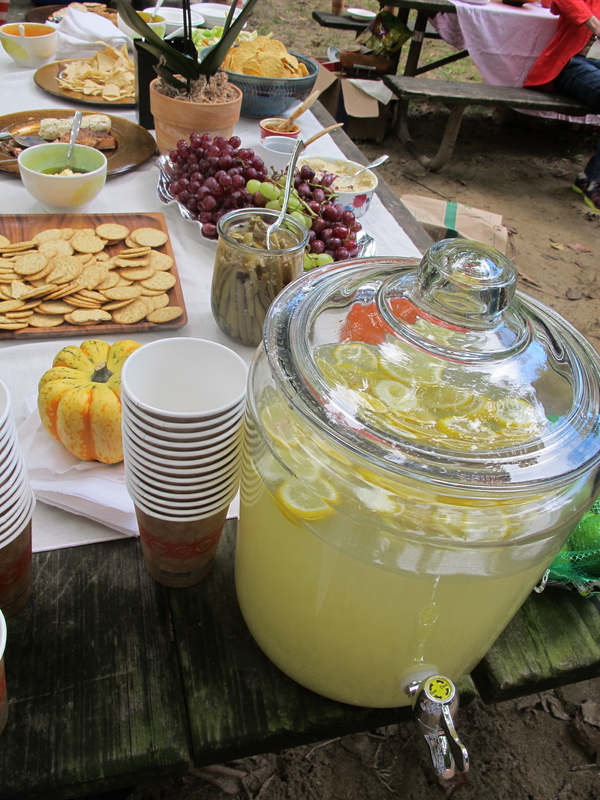 We doused them in maple syrup, and then nibbled the leftovers as snacks all day long. One more thing: most pancakes, at least for me, leave me feeling both overstuffed and under-nourished by the fluff factor. In contrast, these were really filling and provided lots of good energy for the morning. 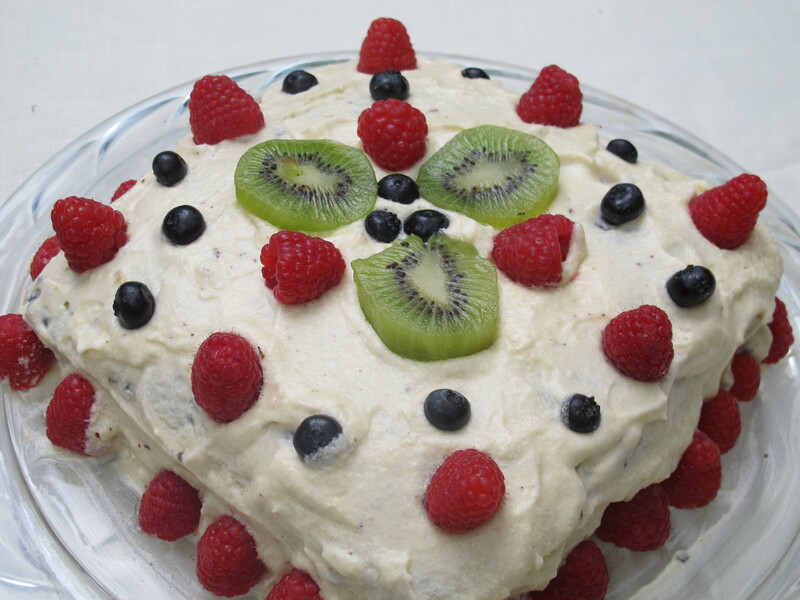 If your kids are older, these definitely beg for funny Grover or Cookie Monster faces on top, using bananas, blueberries, strawberries or grapes. 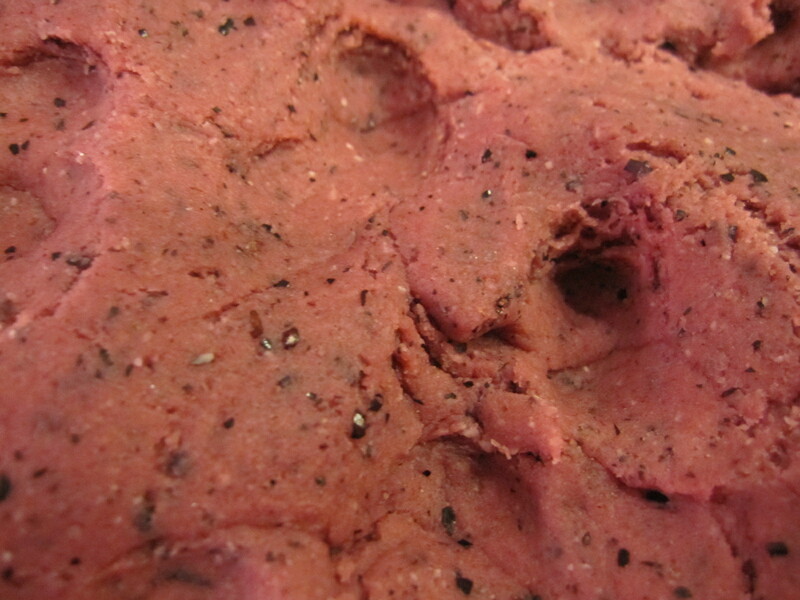 Blueberries are great inside as well, for maximum purple effect. For grown-ups, they’d also be nice blini-sized, with creme fraiche, greek yogurt or goat cheese smeared on them (though you’d want to thin the batter out a bit). 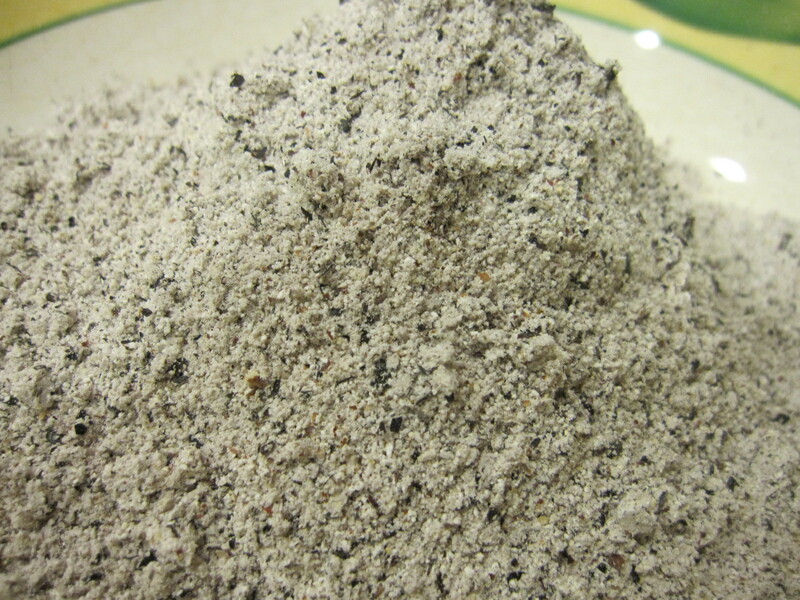 I also tried making polenta with this unique sprouted flour, using my stand-by recipe. It took longer to set up, but was delicious that way as well (next time I’d skip the rosemary, as it crowded the flavors a bit). It was worth all the stirring just to have this bubbling, belching purple cauldron on the stove. 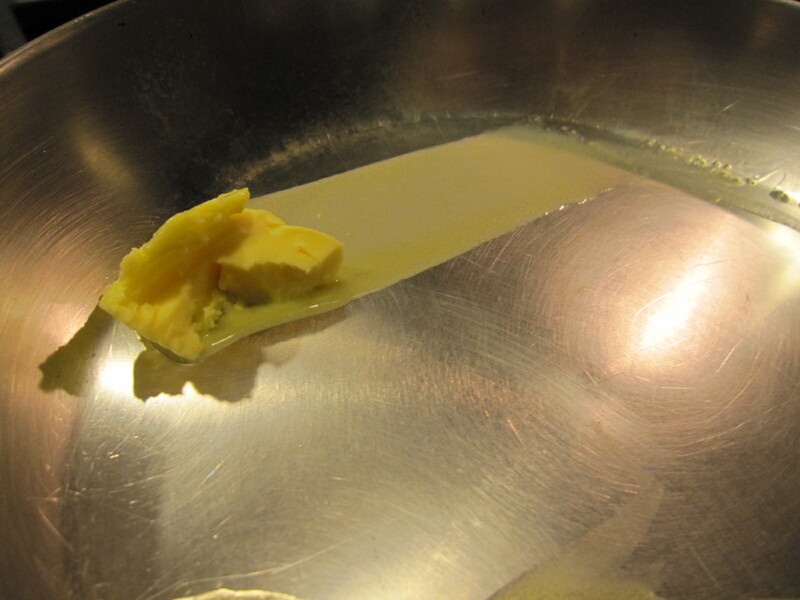 Combine the dry ingredients in a large bowl, and add the eggs, melted butter and milk. This is the fun part, as you watch it turn purple. Really purple. 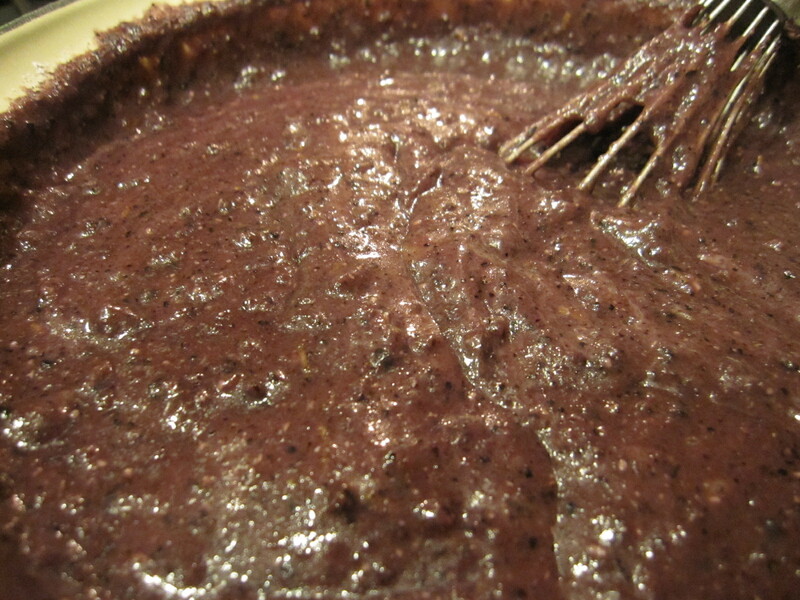 Adjust the consistency with more flour as needed. 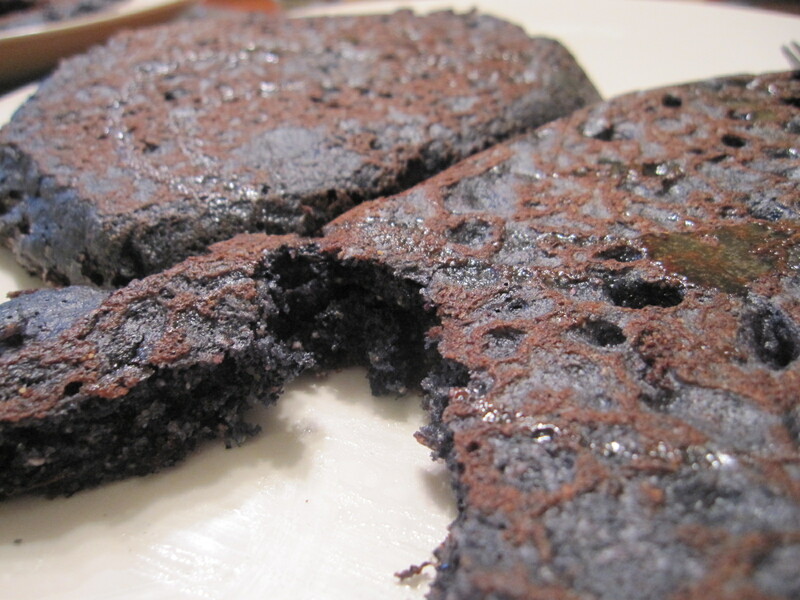 Just like regular old brown pancakes, these do bubble. But they brown quickly as well, so check the edges and flip when those have firmed up a bit instead of waiting for bubbles throughout the middle. 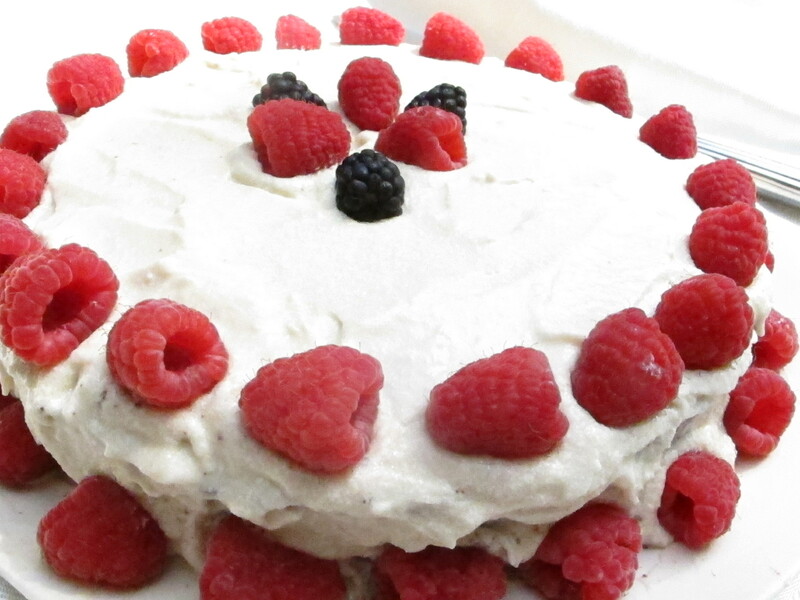 Douse in maple syrup (optional: decorate with silly faces), and serve! 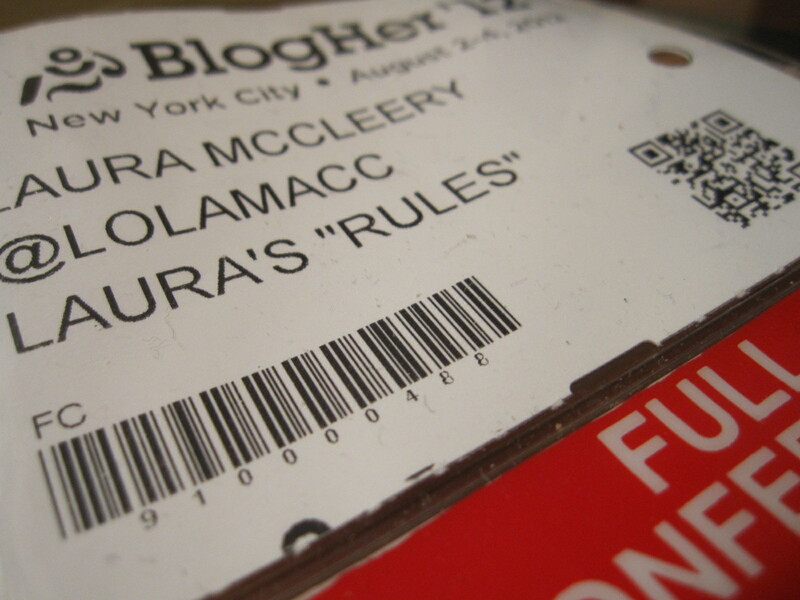 My little moment of snark about Martha Stewart notwithstanding, the Blogher12 conference was amazing and worthwhile. It was full of energy and wit, I learned things from each of the panels, and the workshops, in particular, were incredibly helpful. The highlight for me was today’s lunchtime conversation with Katie Couric, who was insightful, substantive, funny, honest and warm. I hope that her new daytime program finds the viewers it deserves, both because it sounds great and because its success would flag the need for smarter programming for both women and television talk shows generally. Second, I loved meeting all of these interesting, talented women. At lunch, I just happened to be sitting next to Globetrotting Mama, who recently completed (and blogged about) a year-long trip around the world with her family. She was full of practical advice about how to take that kind of a trip, and really clear about its value for her two sons and their family bonds. 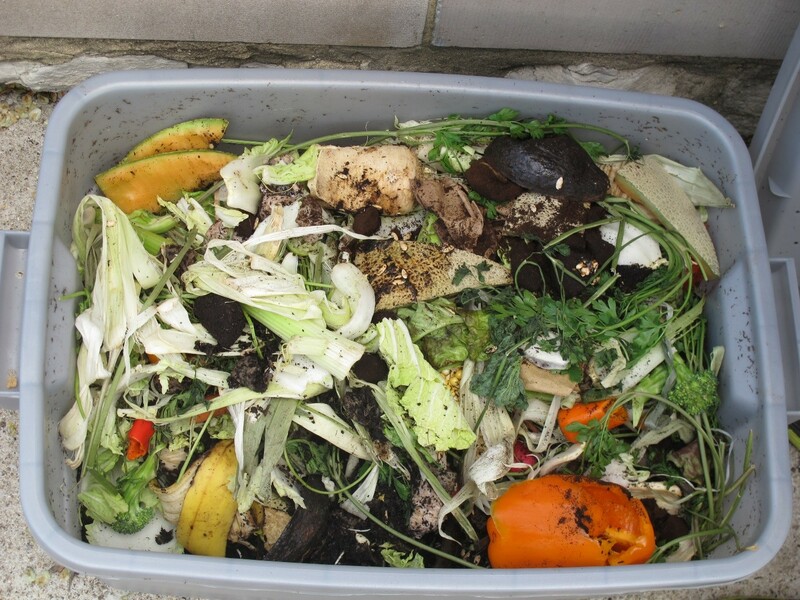 Then, as the coup de grace when things were winding down this afternoon, I stumbled upon Beth Terry, one of my personal eco-heroines, who just published an incredible book, My Plastic Free Life. I’ll be posting a book review soon, thanks to my newly purchased (and signed!) copy. Beth and I had lots to talk about! Blogging is just one platform for increasing social influence. While it may be the heart of what you do, as it is for this wonderful blogger who led my workshop, in the end its traffic, readership demographics, time of stay, etc., measures just one form of social media footprint. Your value will be judged by the total picture across platforms, i.e., your blog, Twitter, Facebook, Google+ etc. As this implies, shortcomings in one platform can be compensated for by connections and influence in another. Metrics and stats matter. This is true not only because they will help to measure your social influence (what old timey poli-sci types call “social capital”), but because you can and should use them to see what kinds of materials, posts and tweets gets your community revved up and rarin’ to go. Then you can give them more of the good stuff they like, and, if you’re lucky, the virtuous cycle takes over. Be your best self. 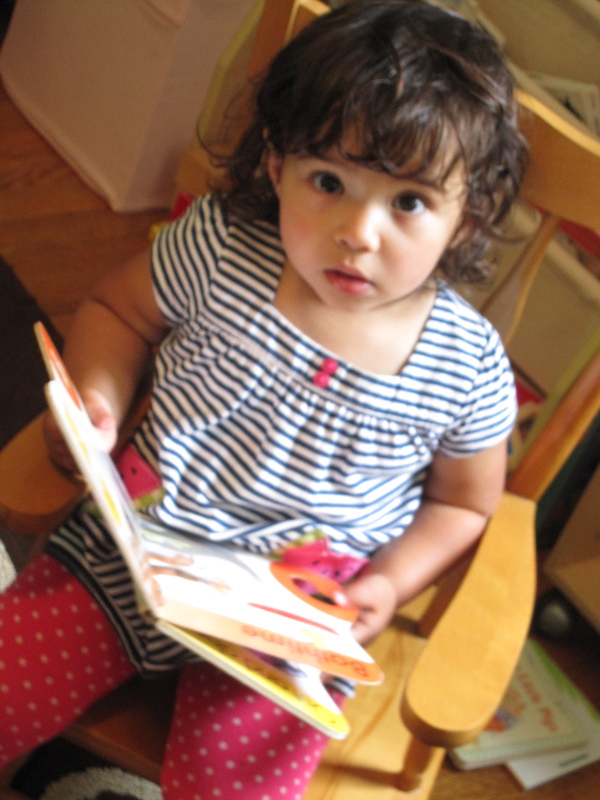 Despite the sneers that mommy bloggers often surreptitiously receive, expectations for people working in this space, unsurprisingly, are the same as in any other profession. You’re ideally supposed to be organized, professional, truthful, be aware of and follow the law, and generally be nice. There are a truly unfair number of platforms, technologies, applications and measuring systems to try to get your head around. Of course they also change all the time. In one session alone, panelists mentioned Klout, Peer Index, Cred, Alexa, and Picmonkey. Others talked about Google Analytics, Google+, Survey Monkey, instagram and Tumblr. Many of these are useful tools, I’m sure, but I was unnerved by visions of myself floating aimlessly from platform to platform managing my Interwebs identity, and wondered when the writing and research might actually get done to make decent content. Connections, as in anything, still matter. But making connections, thanks to the unabashed, and even sometimes forced, intimacy of Twitter, is now far easier than ever before. From panel to panel, the advice was the same: be bold in approaching people, once you know what you want to accomplish and have your materials and story straight. Talk up your strengths and value, and advocate for yourself and your ideas. Be inventive with DIY publicity and promotions. In the book talk, one very crafty craft blogger shared her kamikaze marketing tactics, which included calling up the sewing machine company featured in her novel for a give-away, barnstorming the book signings of authors she liked to build goodwill towards her own book blurbs, and holding workshops with the purchase of her book built into the cost. Another made satirical videos to promote her book, as well as educational guides for schools. The takeaway was that the more channels and promotional avenues you have for your content, the better. There are a lot of people trying to do this, and (understandably) to make some money at it, and it’s not easy to do it well. While the Expo Hall was full of potential sponsors who want to engage the viral marketing potential of female bloggers and their audiences, it also seemed clear that the number of people who will dramatically succeed – at least enough to make a living at it – is far smaller than the number of us interested in making a go at it. Many people just use the Web – and blogging and other social media – for connection, personal journaling, and to give voice to fears and feelings. 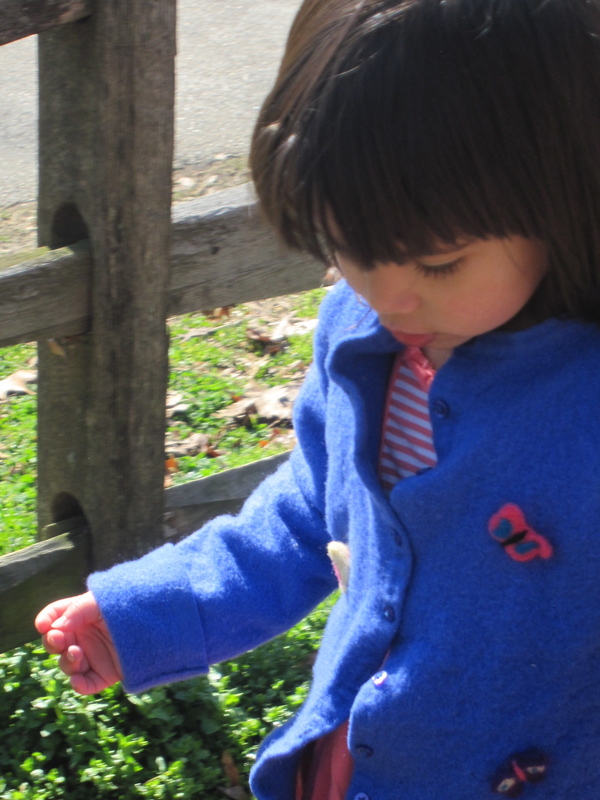 There was the wonderful woman I met who blogs about her depression and thoughts of suicide anonymously but courageously, and the woman with an autistic child who studies and writes about the science on autism. Blogs are places to share, build community, and get a comforting and perhaps even therapeutic confirmation that the things about us that make us feel alone are almost always things that other people are experiencing right now. This avenue for expression is not going away. 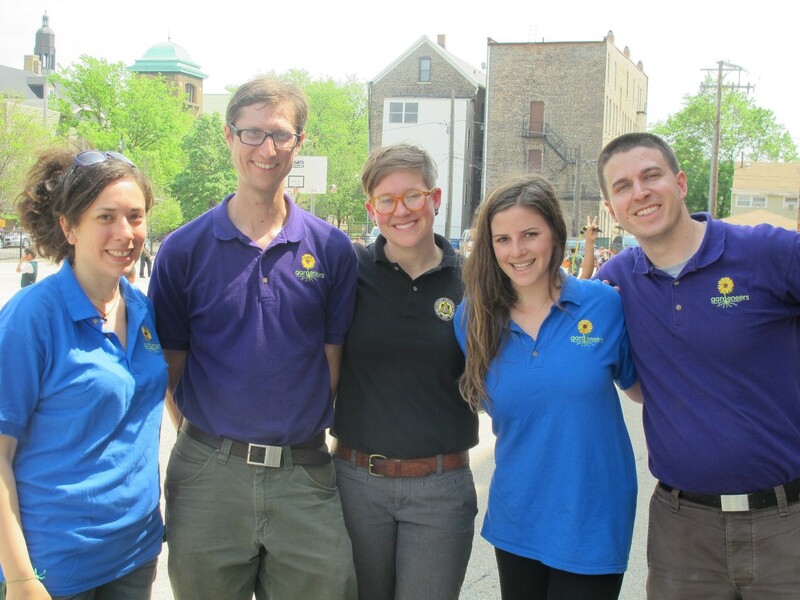 It remains a very powerful way to find like-minded people and to give a thousand voices to the many ways we navigate our lives. While there were nice breaks for informal networking, if I had one suggestion for the next BlogHer, it would be that there should also be space on the official calendar for like-minded bloggers to find each other, so that they can better get to know each other in-person and discuss common interests. BlogHer could be a place to create networks across many more spaces – with less being talked to, and more talking to each other. In this kind of space, bloggers could hatch ideas to help each other out, pooling technical or other expertise, or maybe even share their ideas for changing the world to reflect the many things we all dream of and hope for, both on-line and off. What did you get out of the conference? What nuggets of wisdom do you have on the event or blogging in general? I’d love to hear!